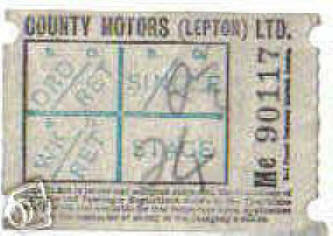 LEYLAND LT1 50375 Leyland B?F 1929-? 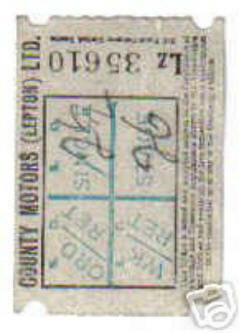 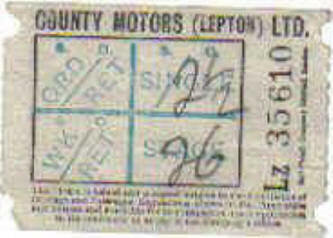 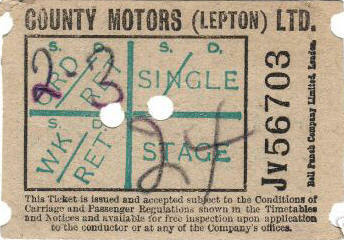 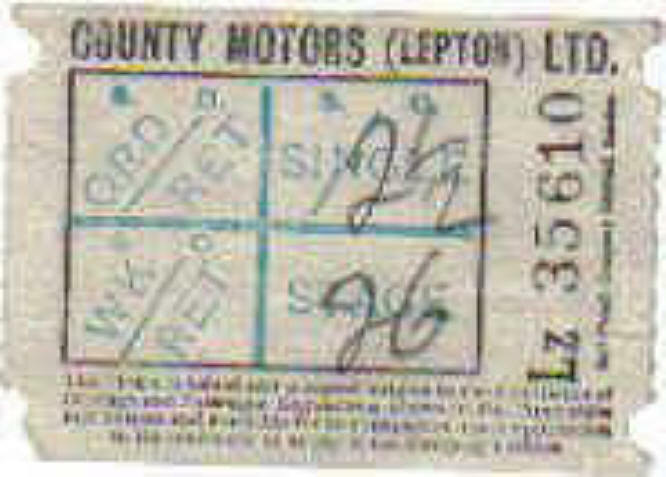 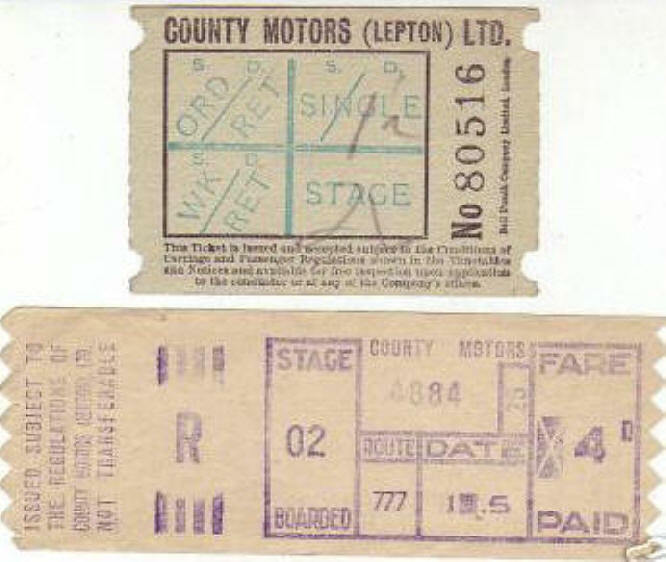 County Motors, On the 11th October 1919, A & B Farrar, trading as County Motors commenced a route between Huddersfield and Lepton, via Emley and Flockton using ex-War Department chassis. 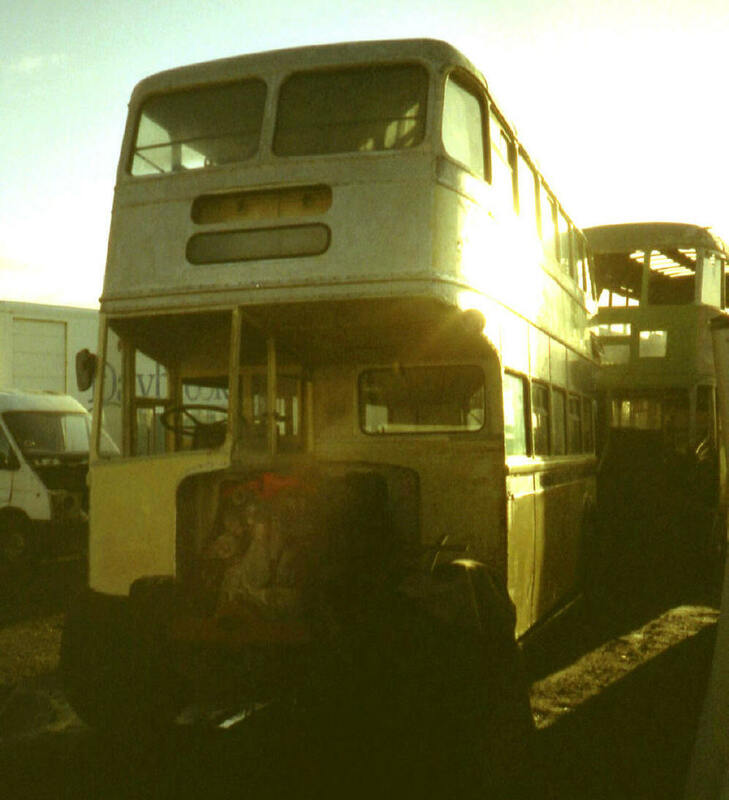 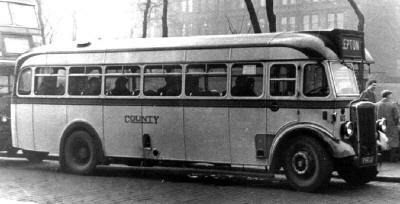 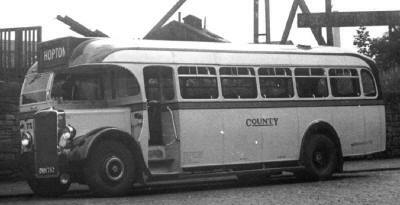 Some of the early vehicles were lorries with seats. 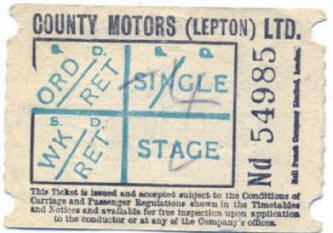 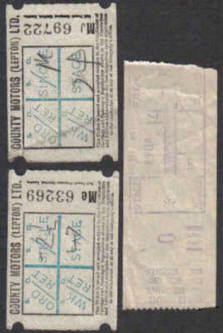 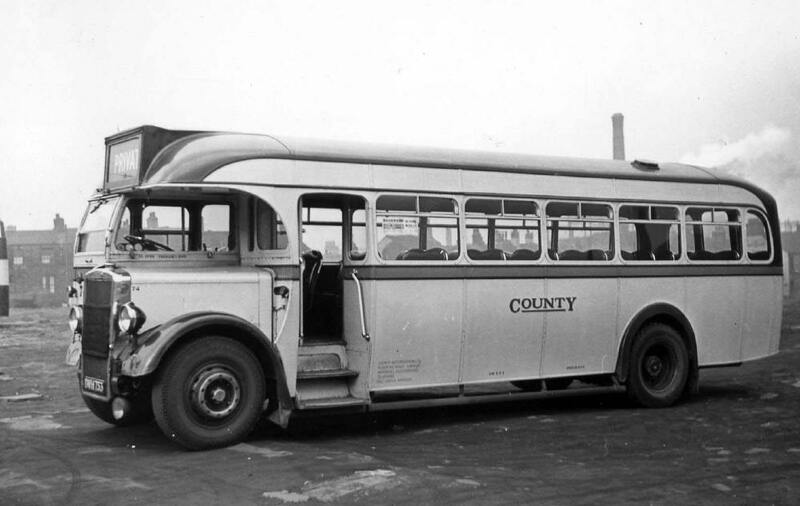 The company was incorporated as County Motors Ltd. on the 22nd December 1919. 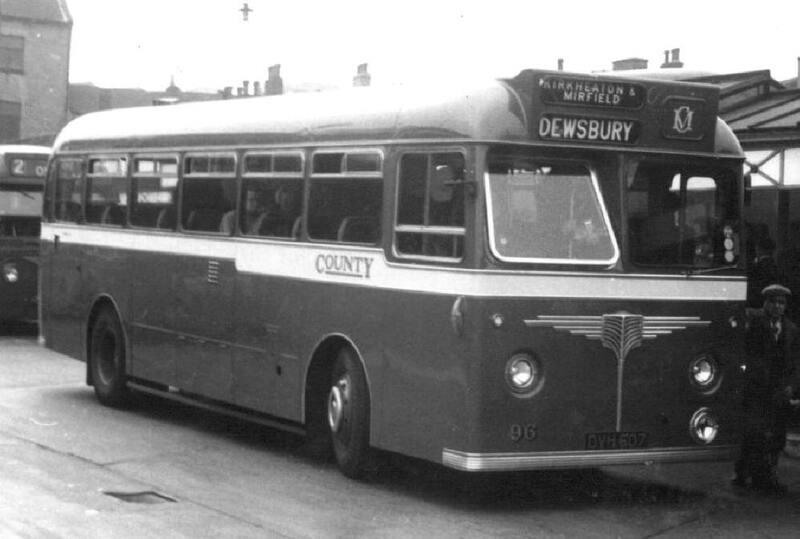 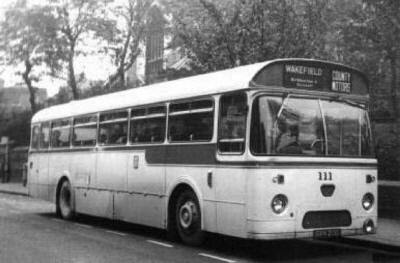 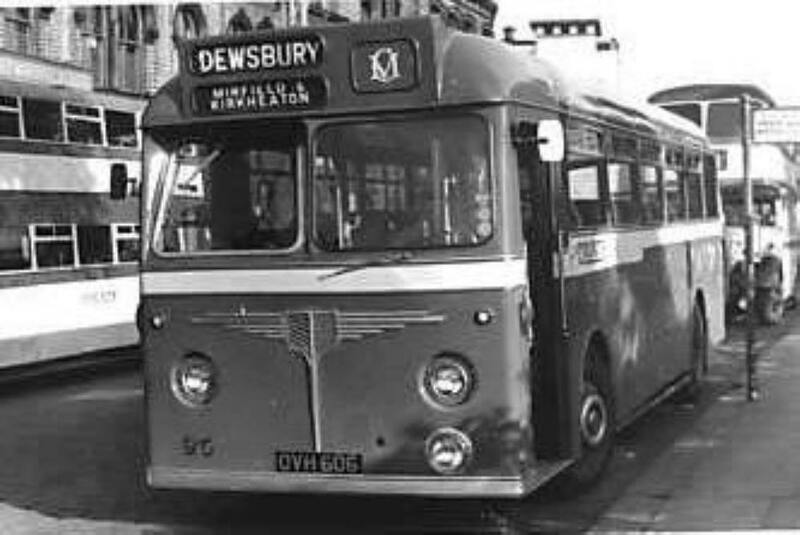 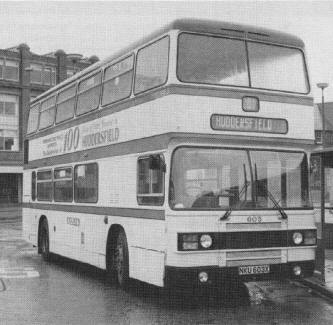 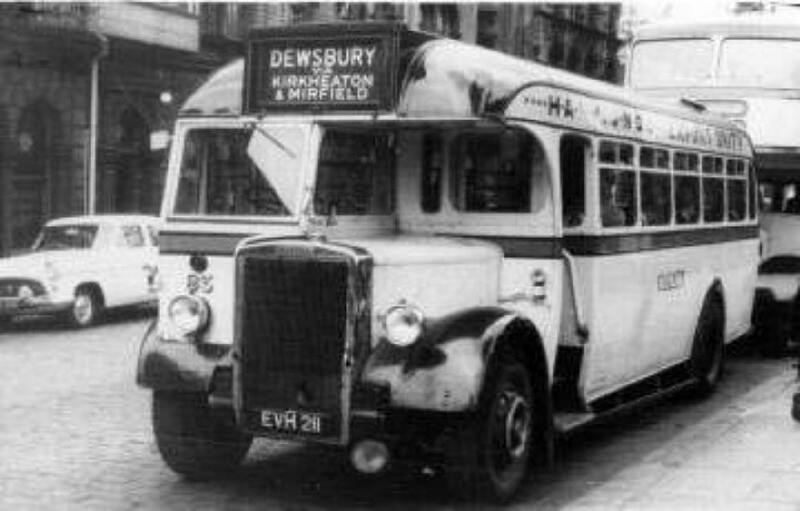 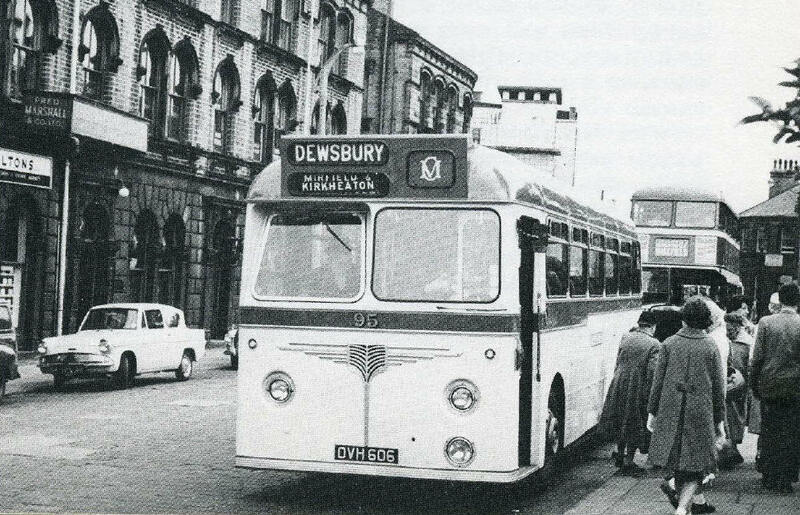 In 1923 the company commenced further services to Wakefield and Dewsbury and by the end of 1926 the fleet numbered 18 vehicles. 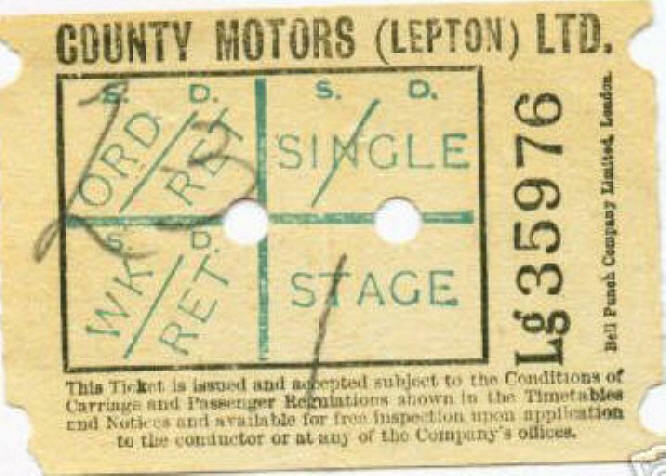 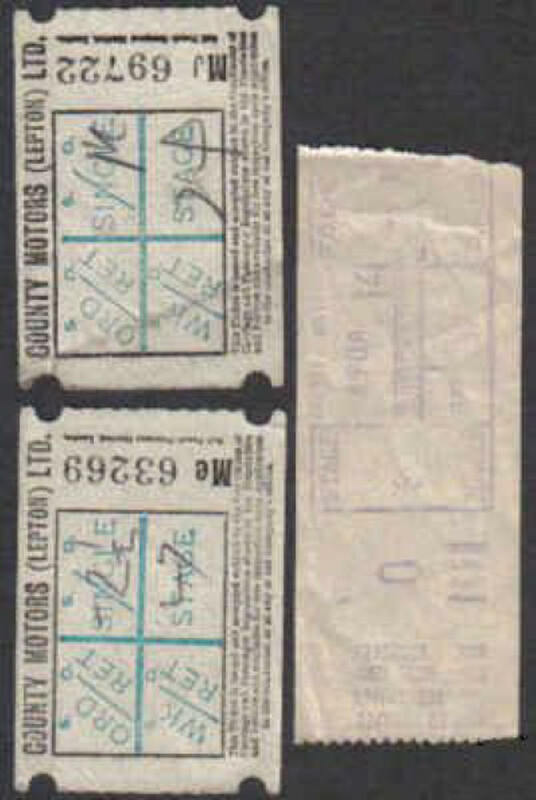 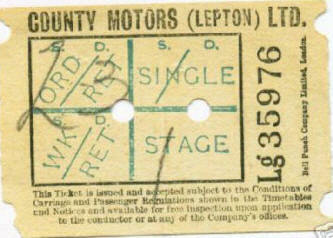 The business was put up for sale in January 1927 and in August of the same year control of the company passed jointly to Barnsley & District Traction (the forerunner of Yorkshire Traction) and Yorkshire (Woollen District) Electric Traction Ltd., both of whom were BET companies, and the West Riding Automobile Company, a independent company. This combination of owners led to County Motors being maintained as a separate operating entity for a number of years and vehicle policy reflected the tastes of its three co-owners, who also provided all administration and maintenance facilities. 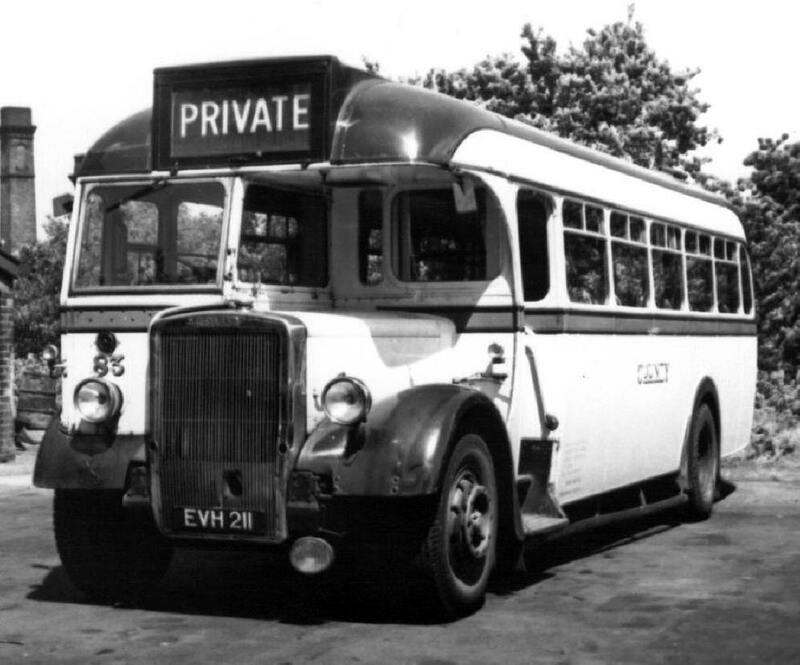 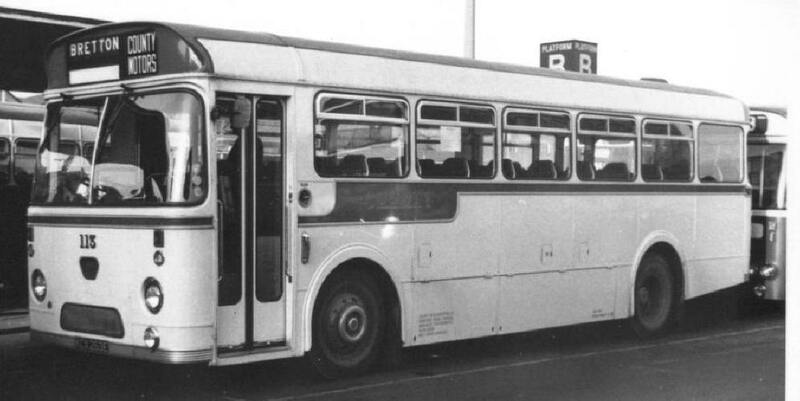 Although the route network changed little over the years, the original vehicles acquired in 1927 consisting of a number of Reo Pullman and AEC saloons were soon replaced by the more heavyweight Leyland Lion chassis and subsequently by the Leyland Tiger. 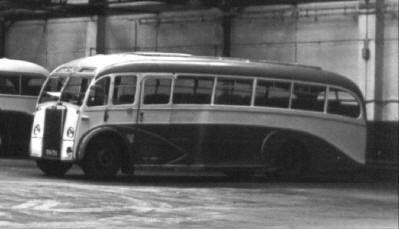 The first vehicles for the newly acquired operator were Nos. 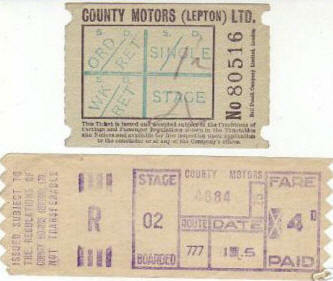 28-29, Leyland PLSC3's of 1928, followed in 1929 by a number of Leyland LT1's (Nos. 30-36). 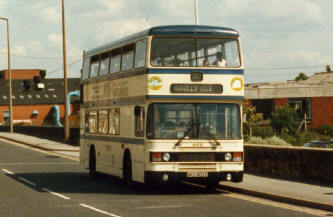 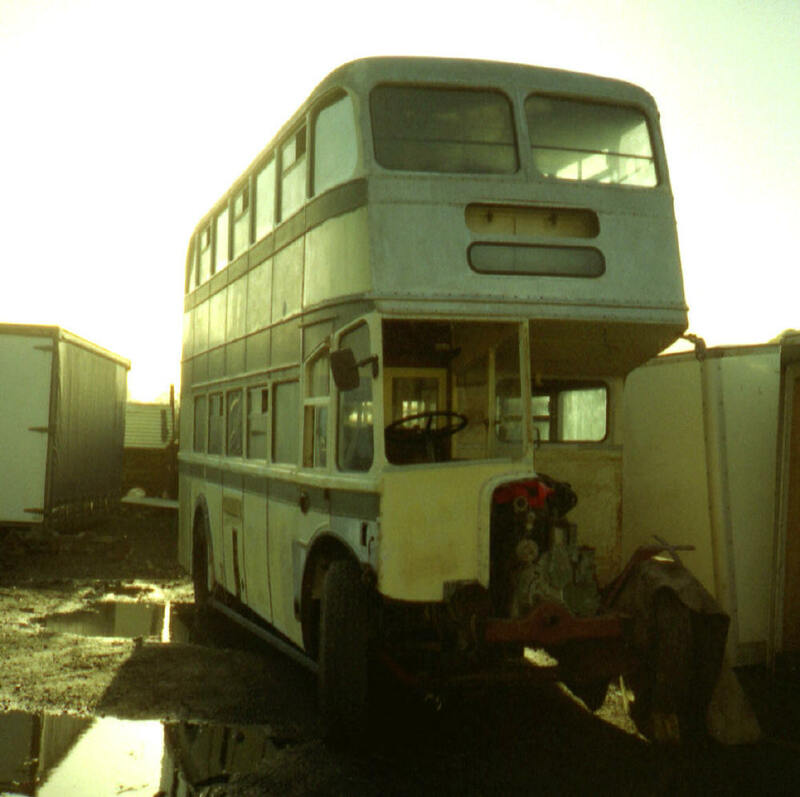 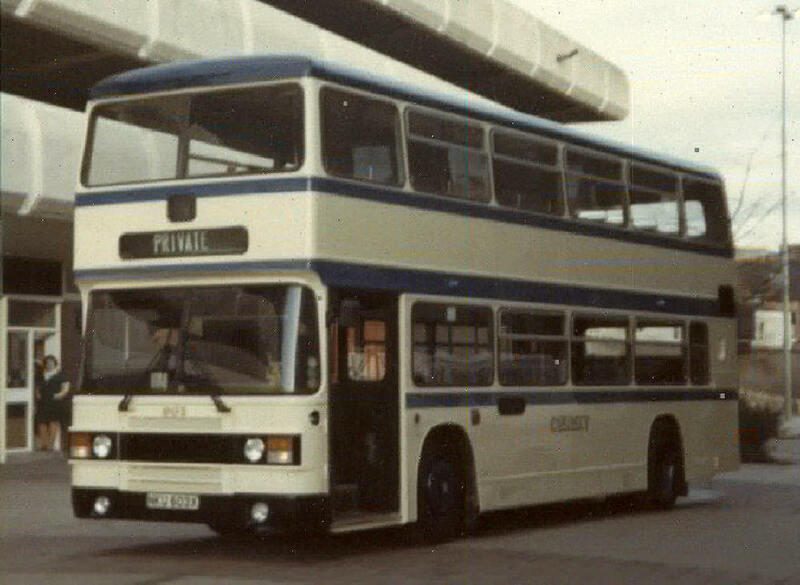 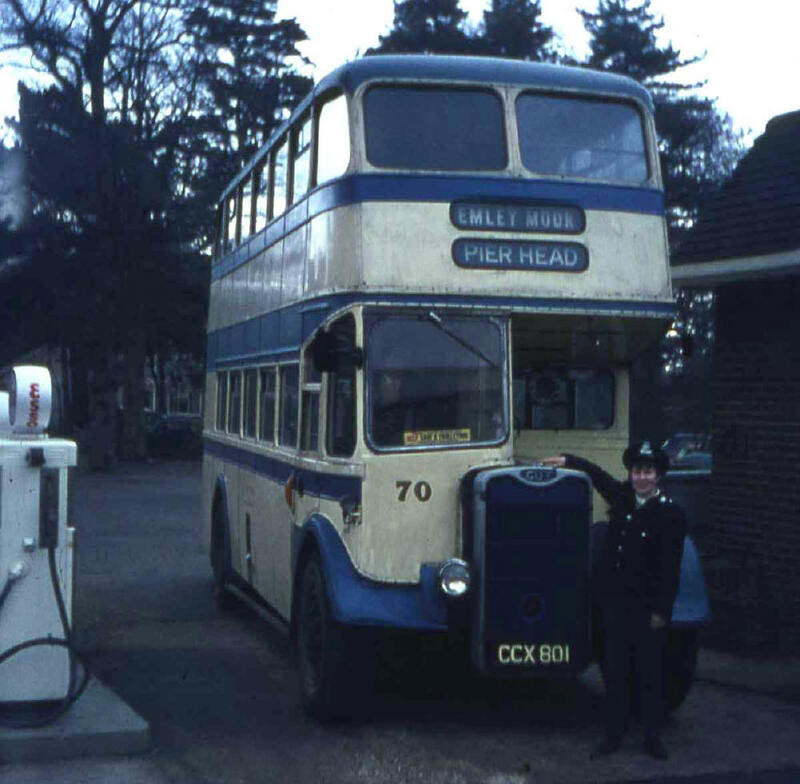 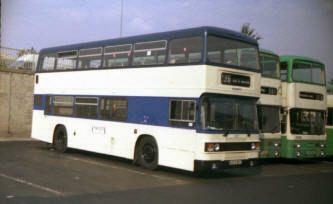 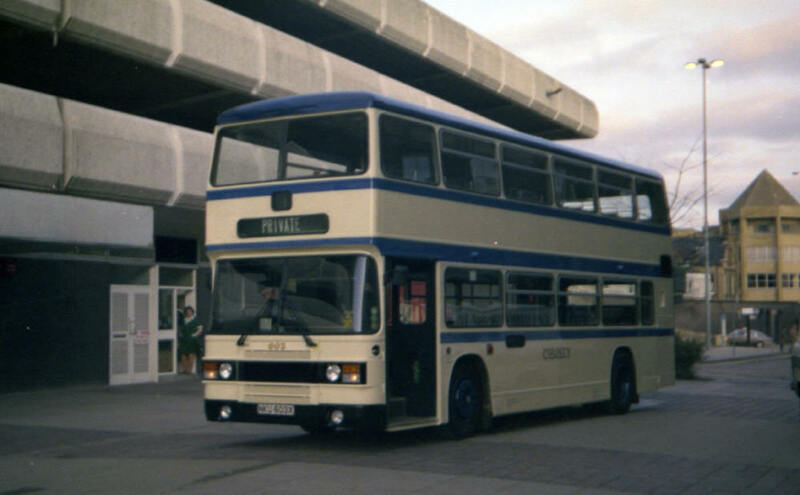 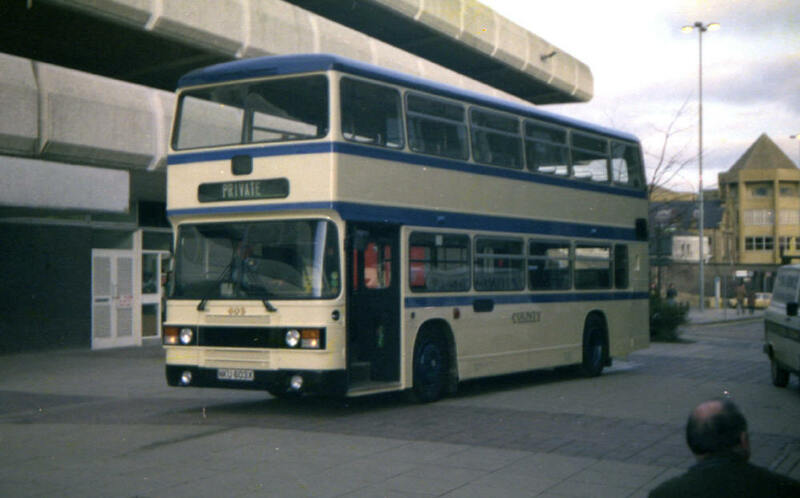 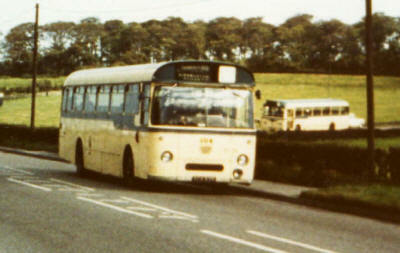 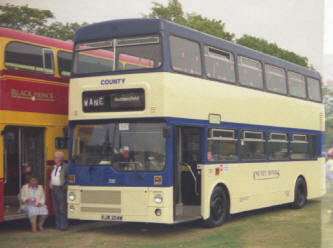 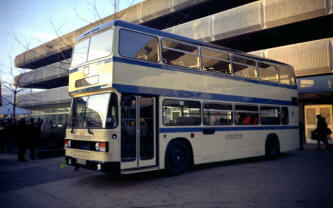 Leyland Tiger 73 is now preserved. The fleet was never large and was garaged at the Waterloo depot, which Yorkshire Traction had acquired with the business of Mitchell in 1925, selling it to County Motors in 1927. 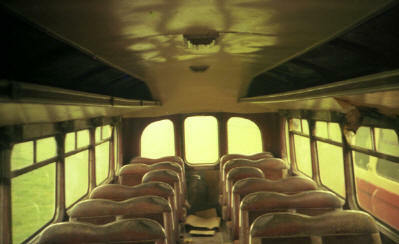 It is still in use now again in the hands of Yorkshire Traction. 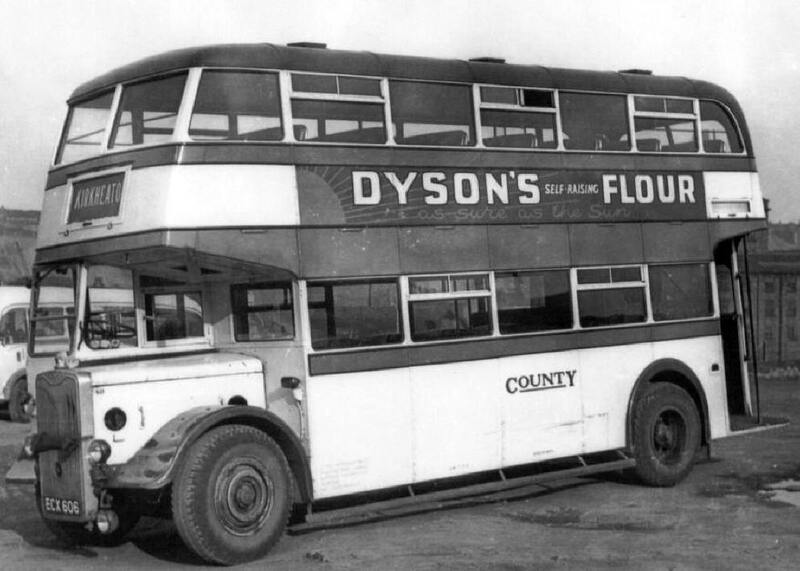 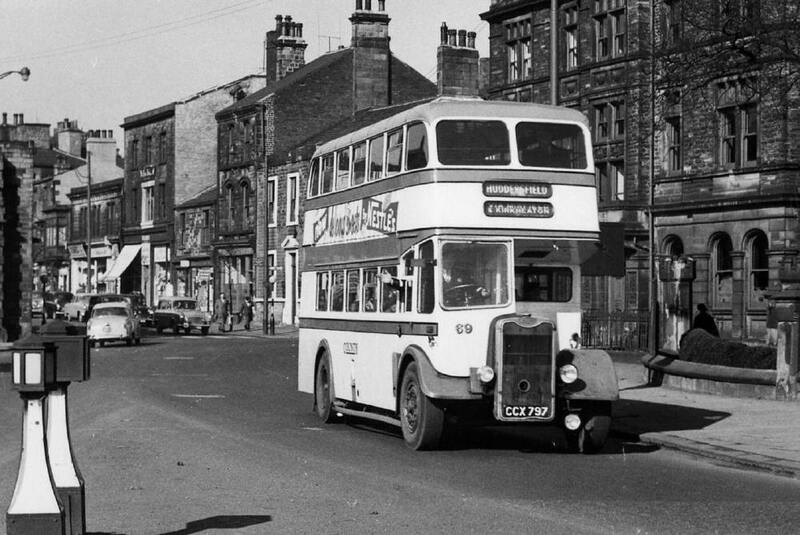 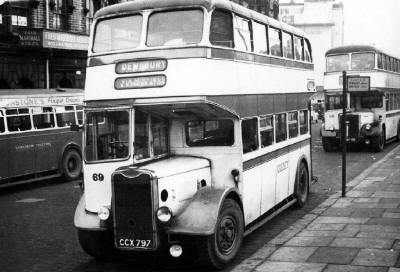 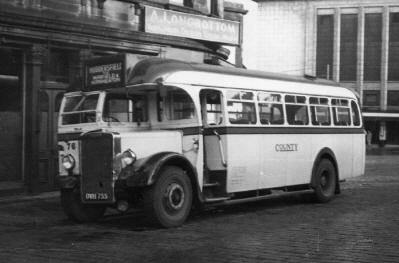 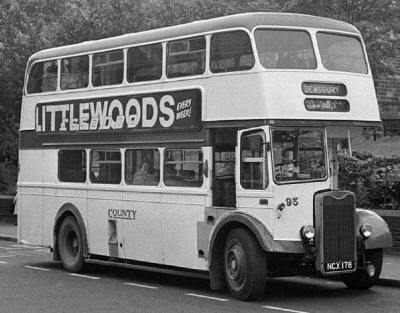 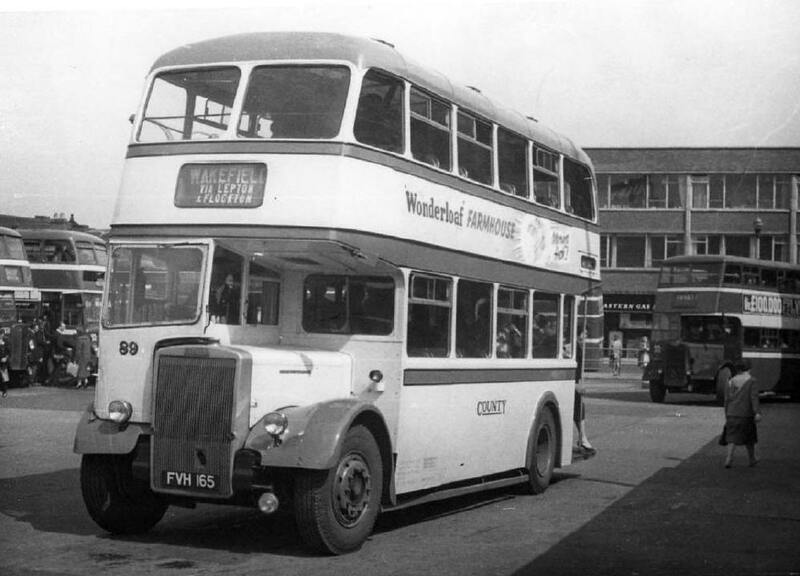 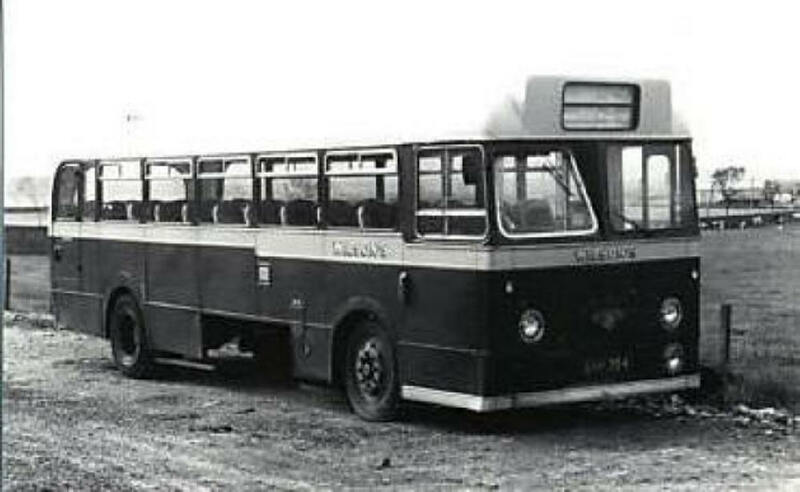 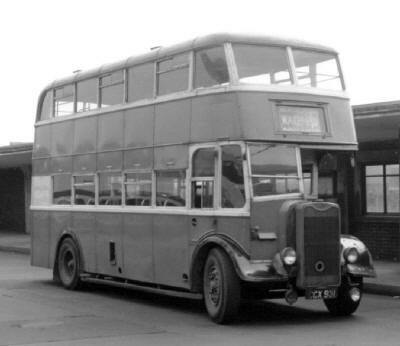 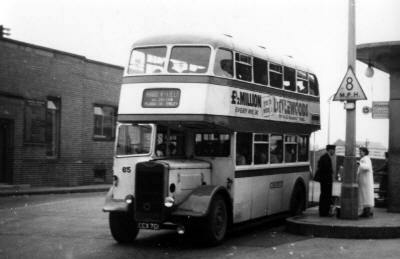 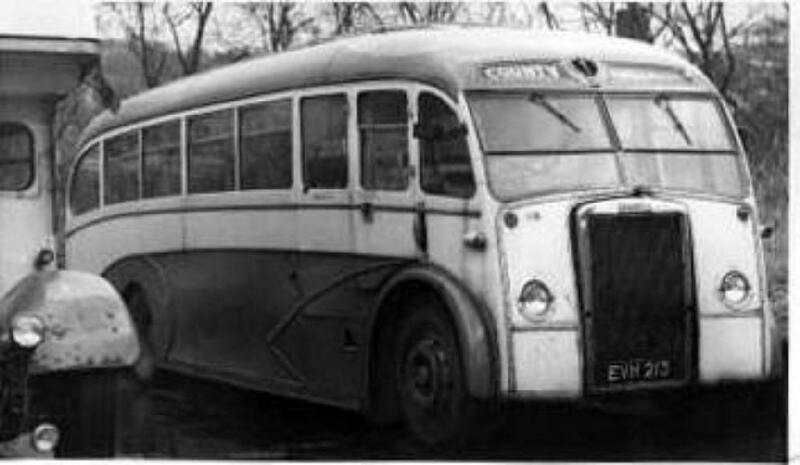 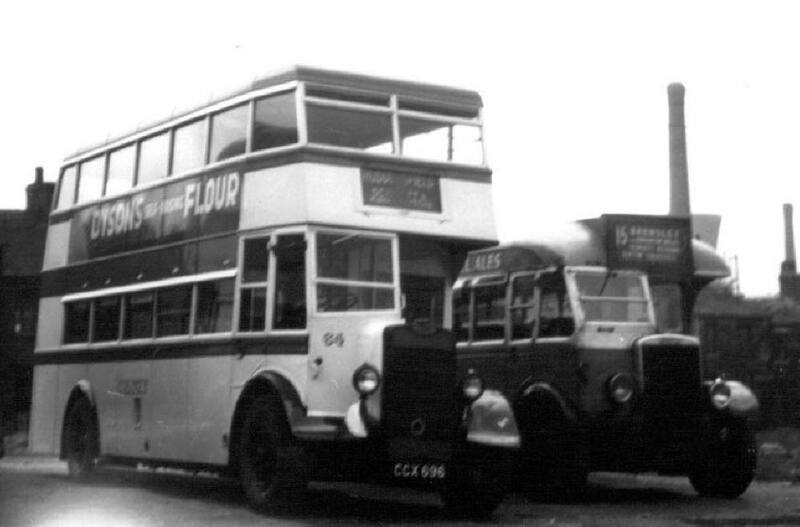 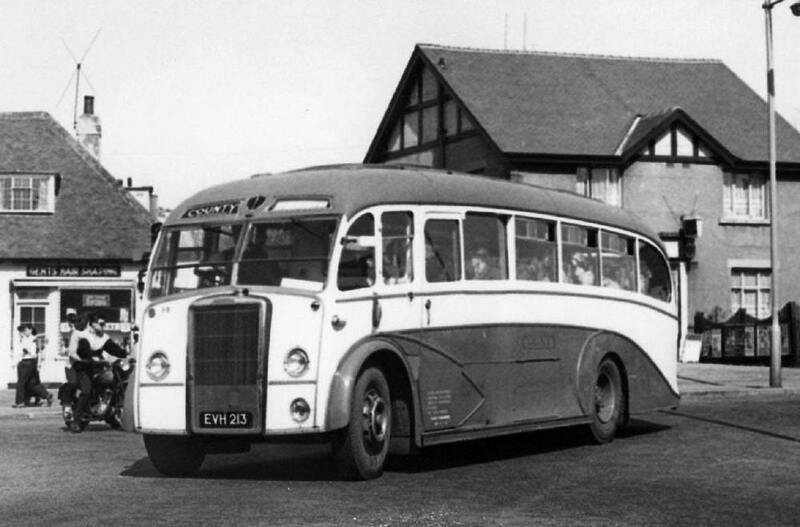 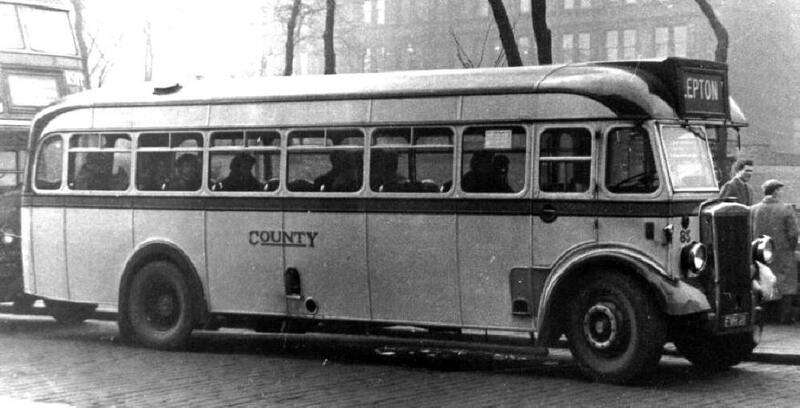 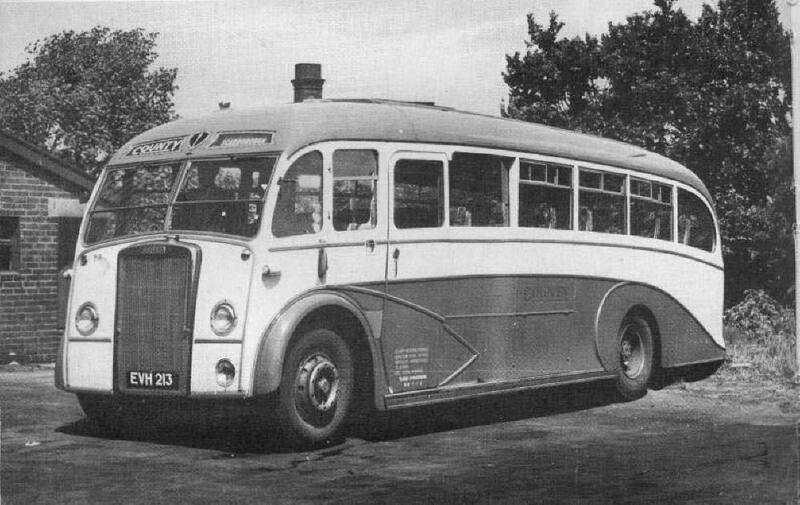 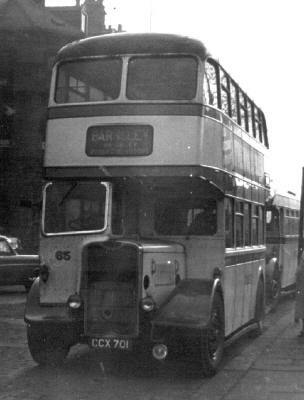 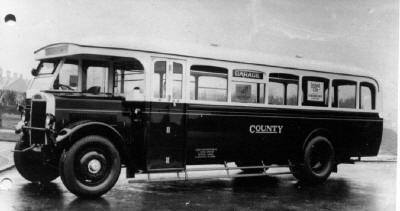 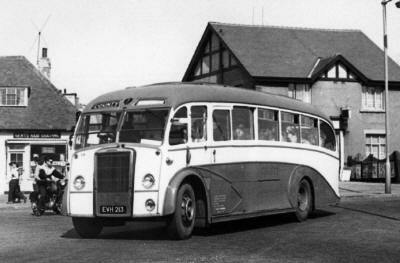 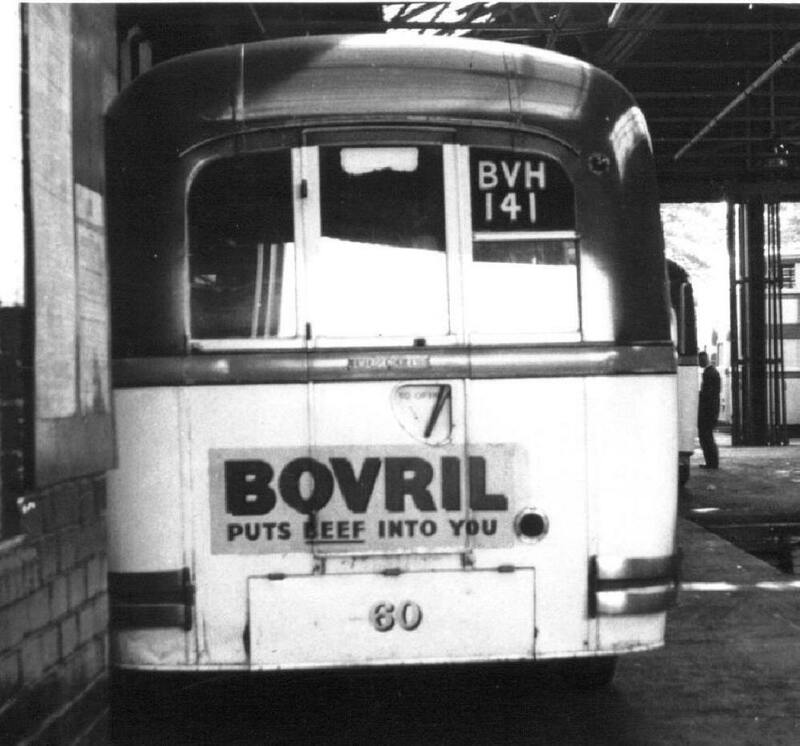 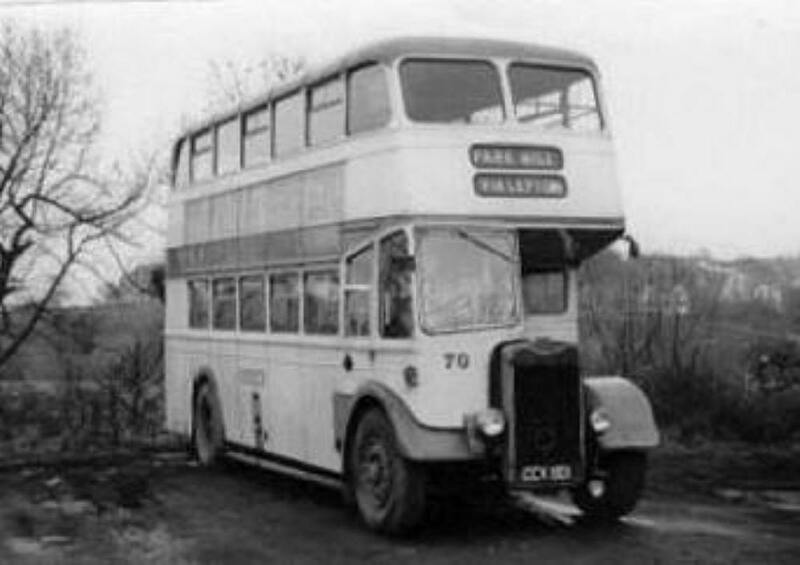 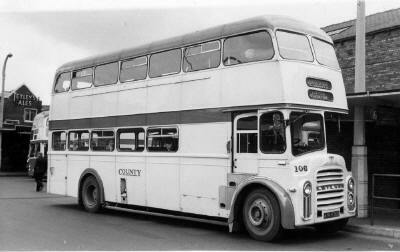 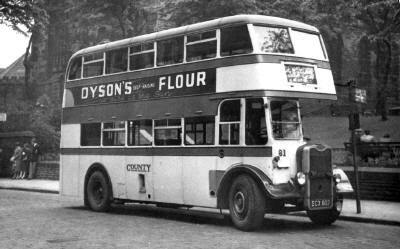 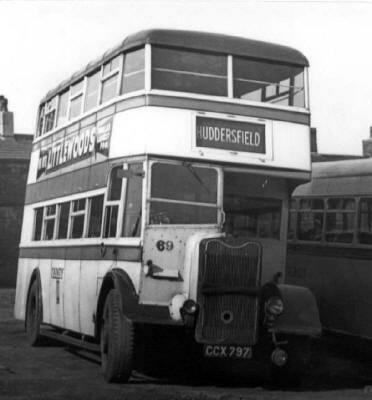 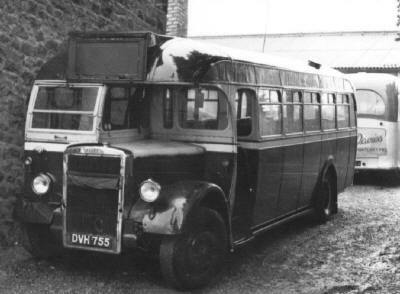 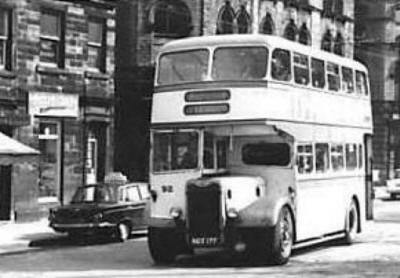 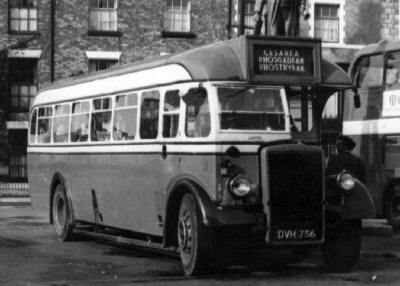 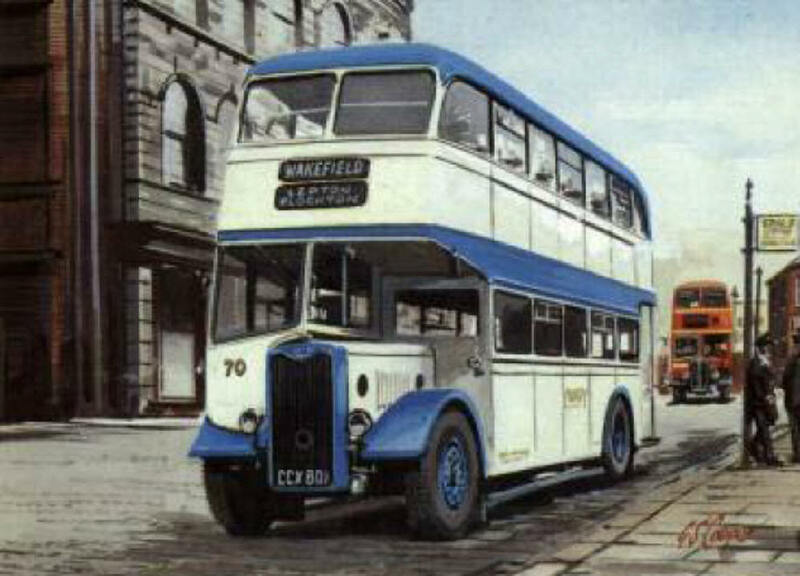 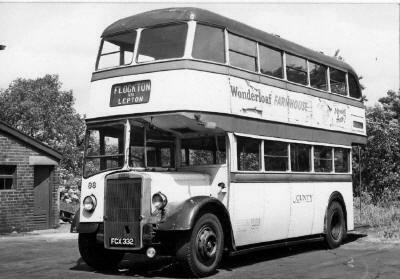 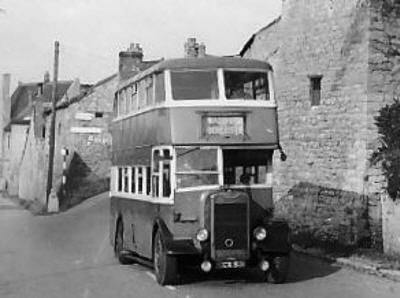 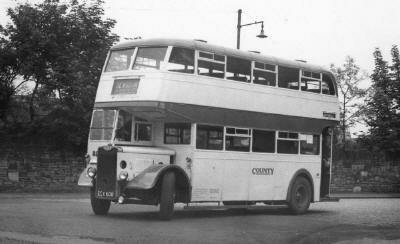 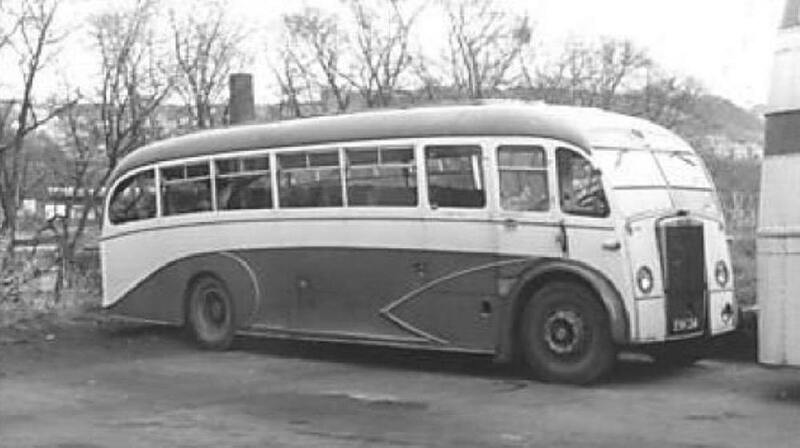 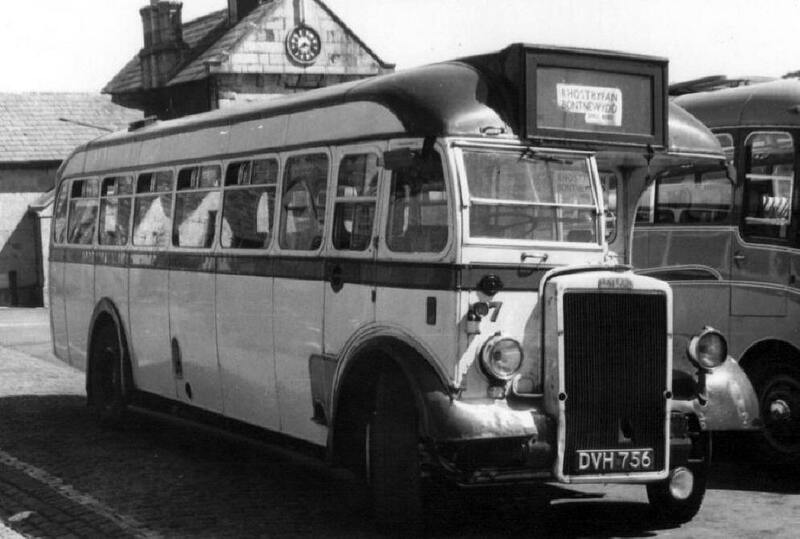 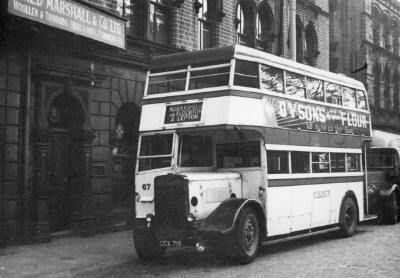 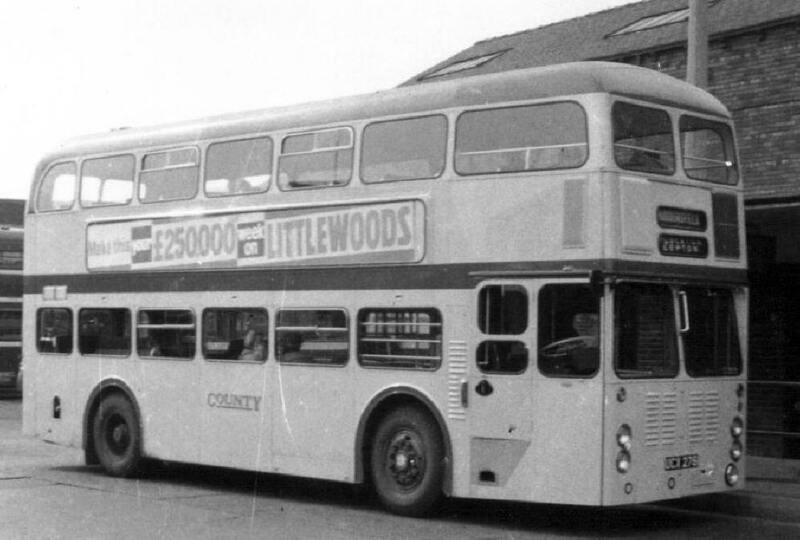 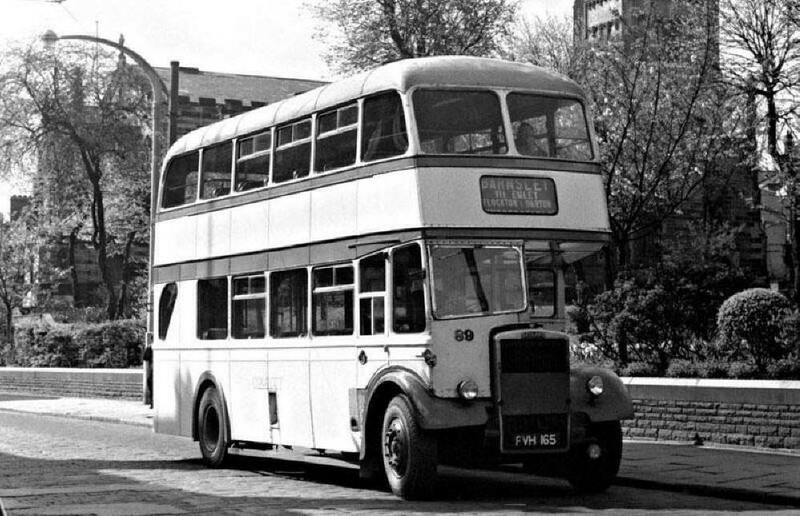 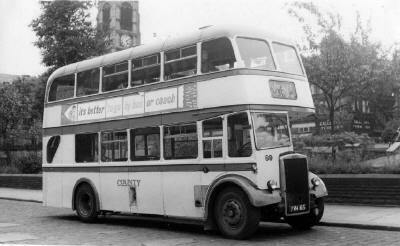 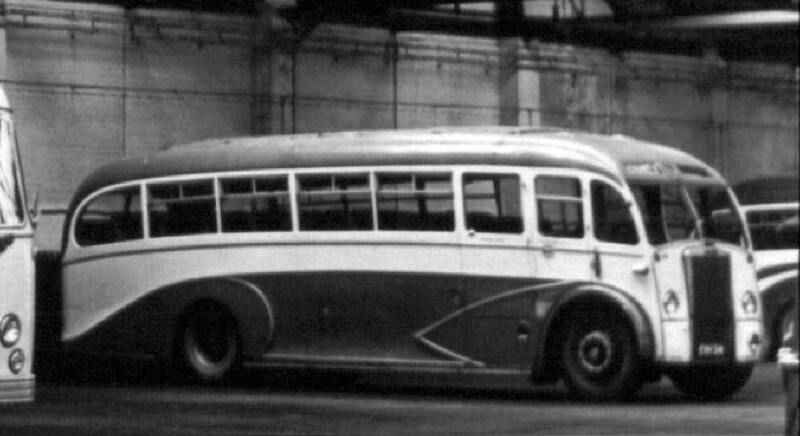 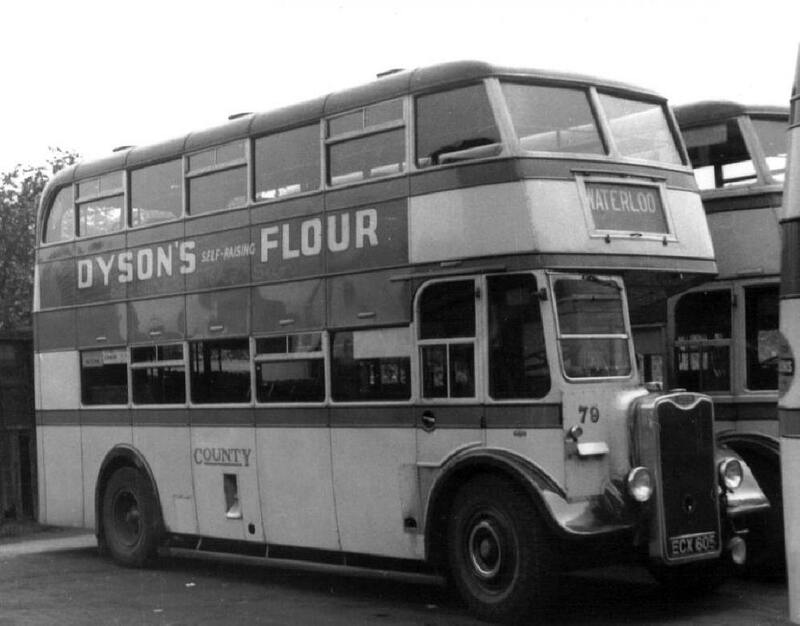 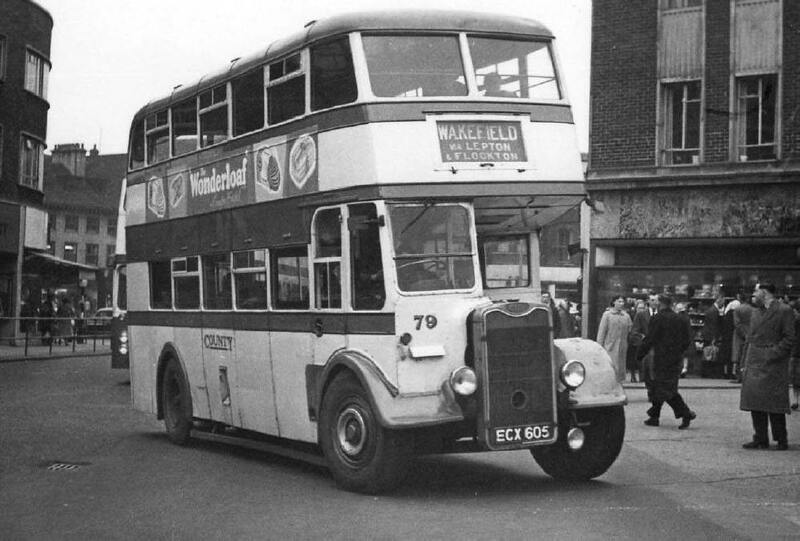 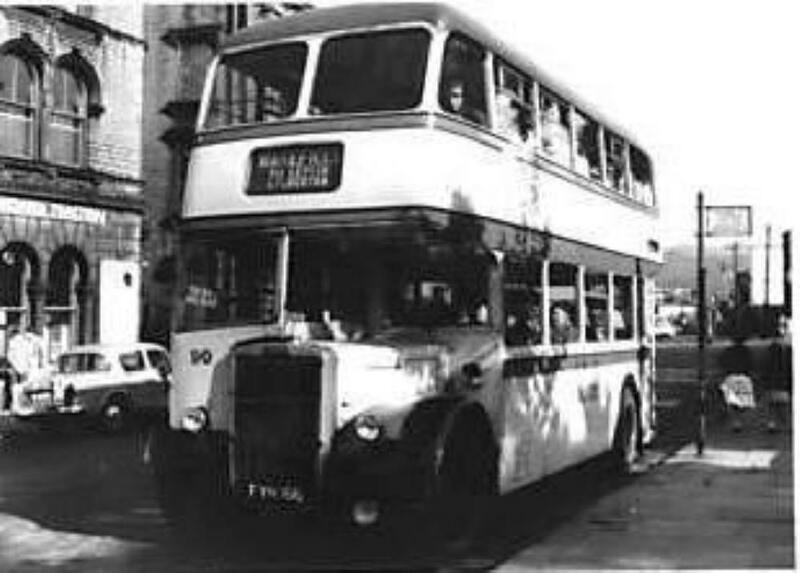 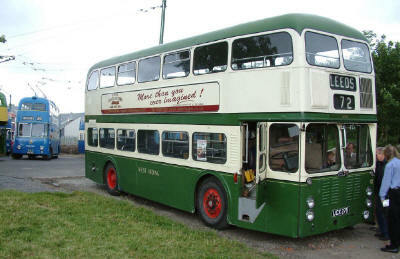 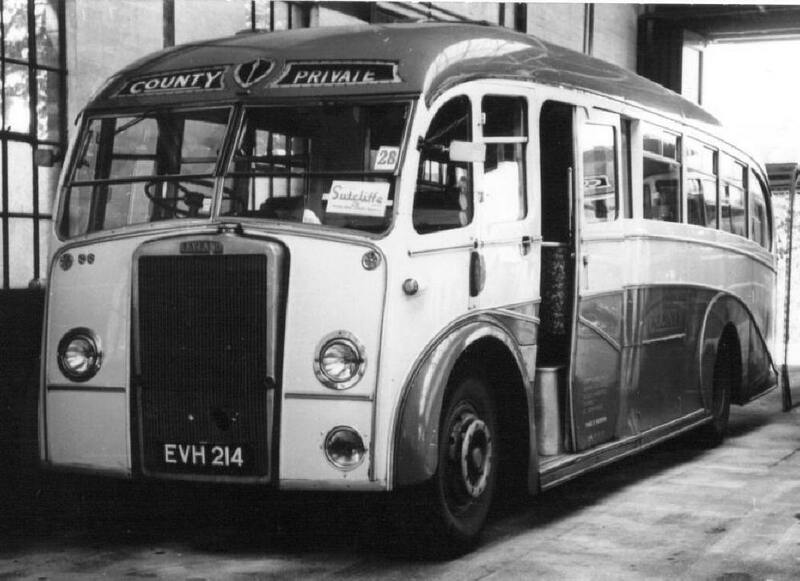 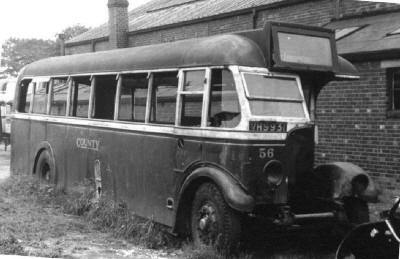 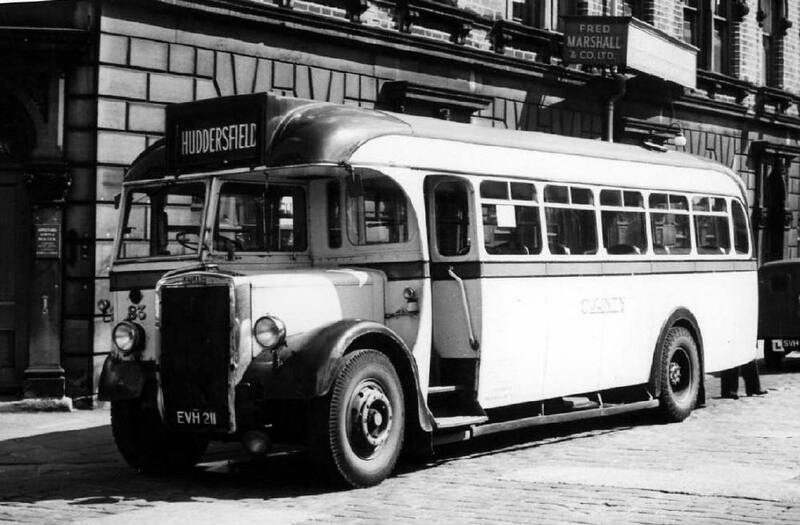 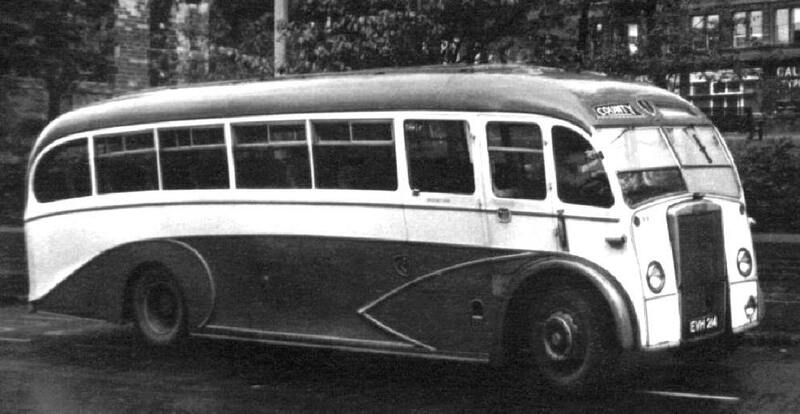 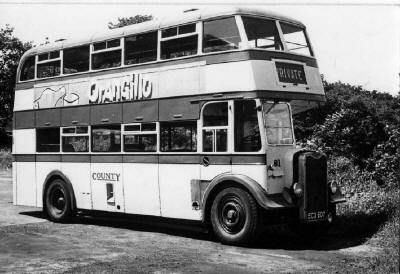 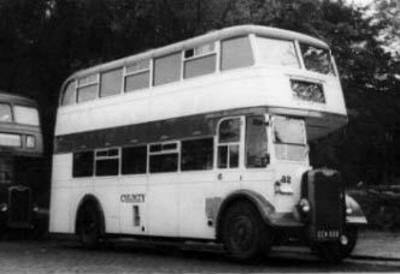 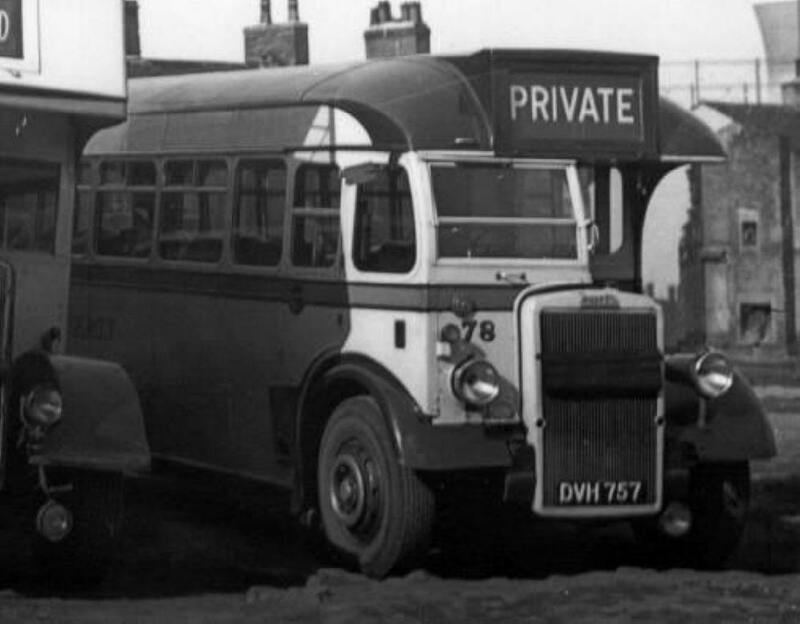 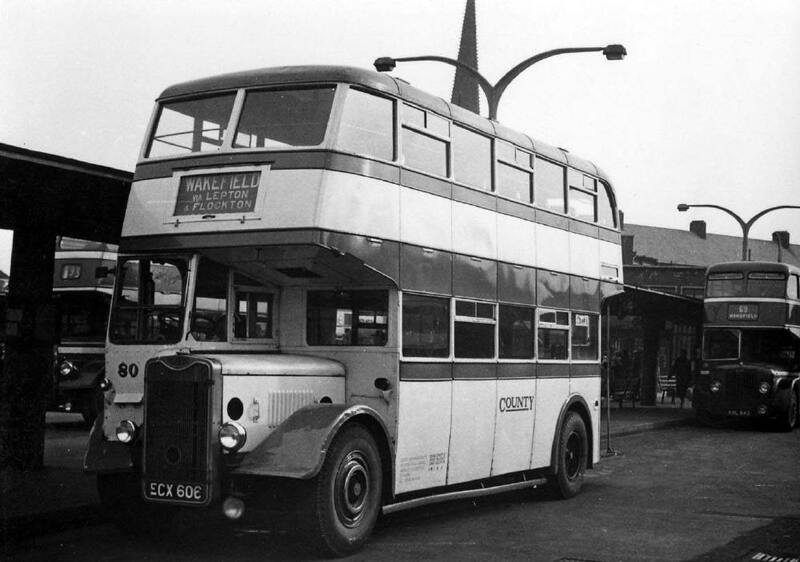 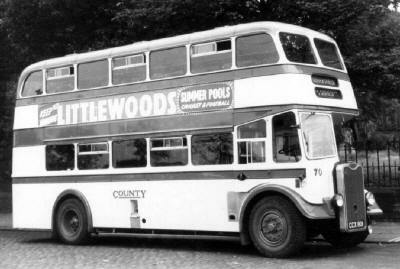 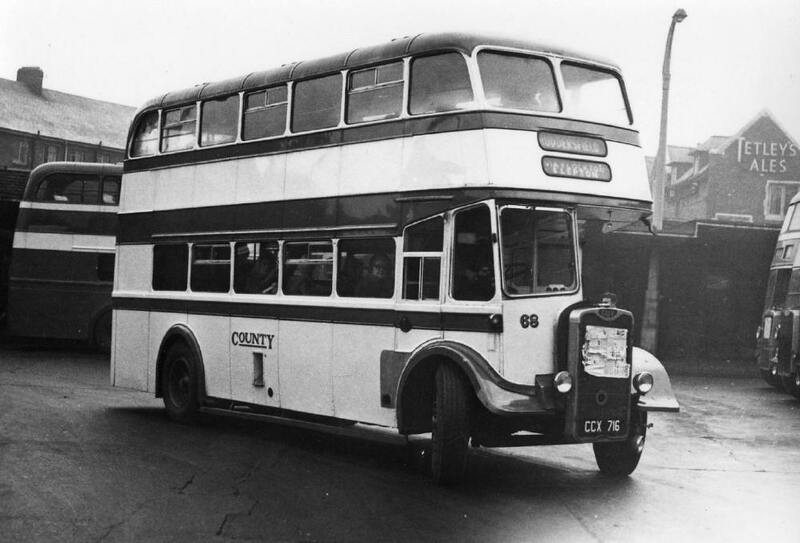 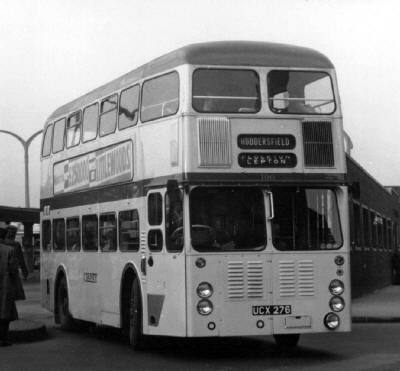 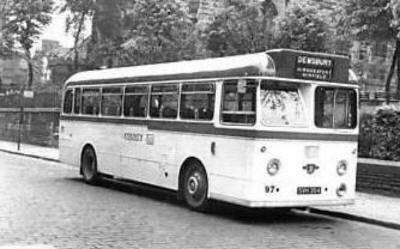 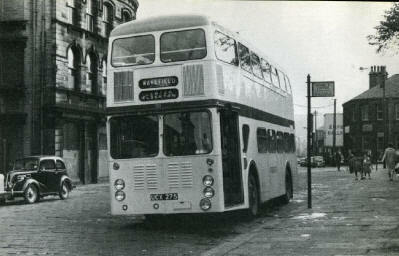 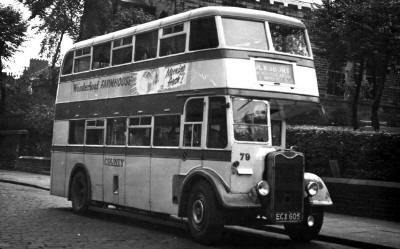 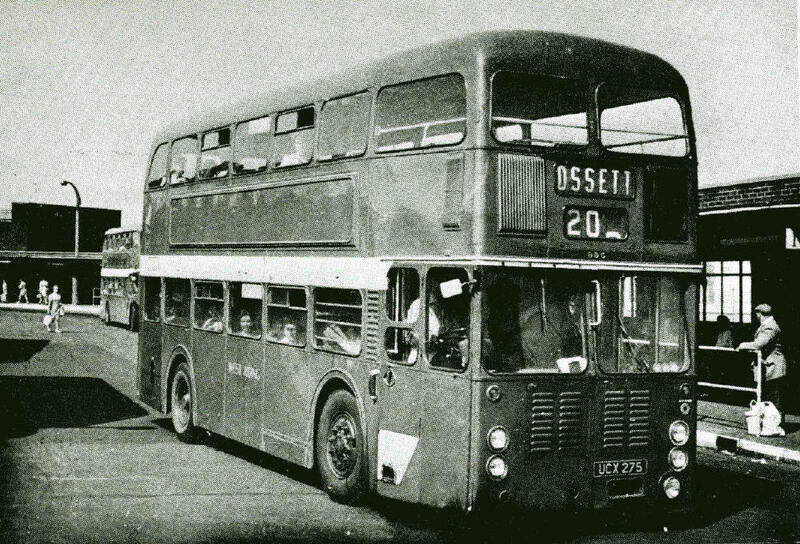 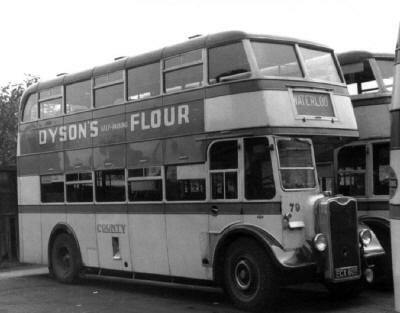 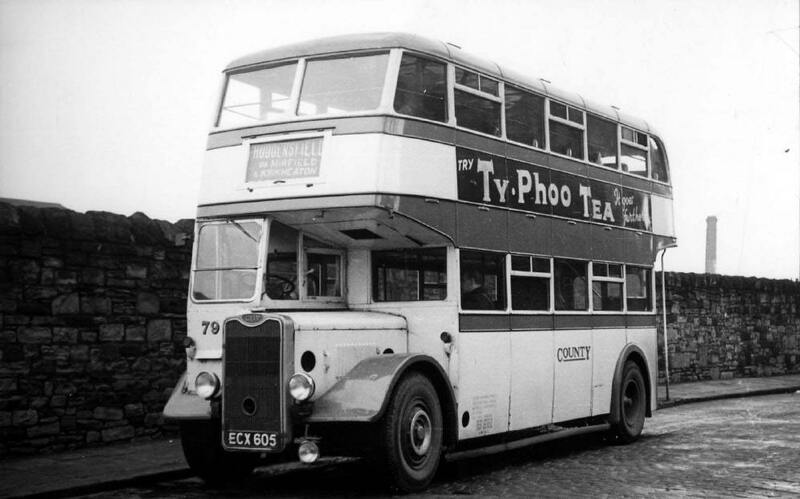 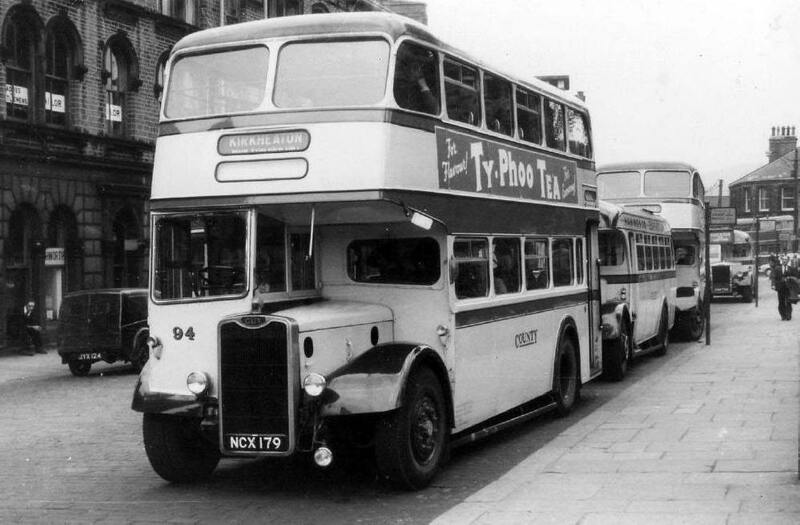 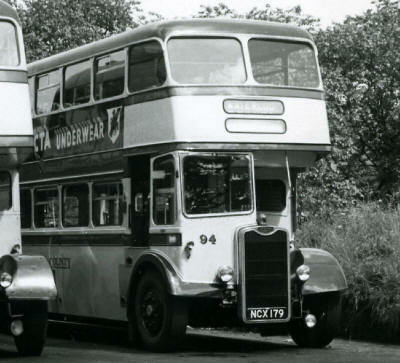 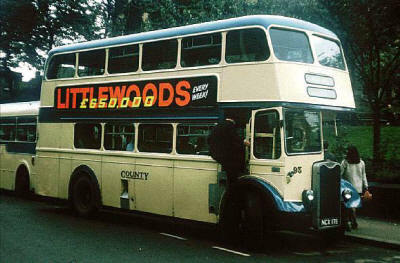 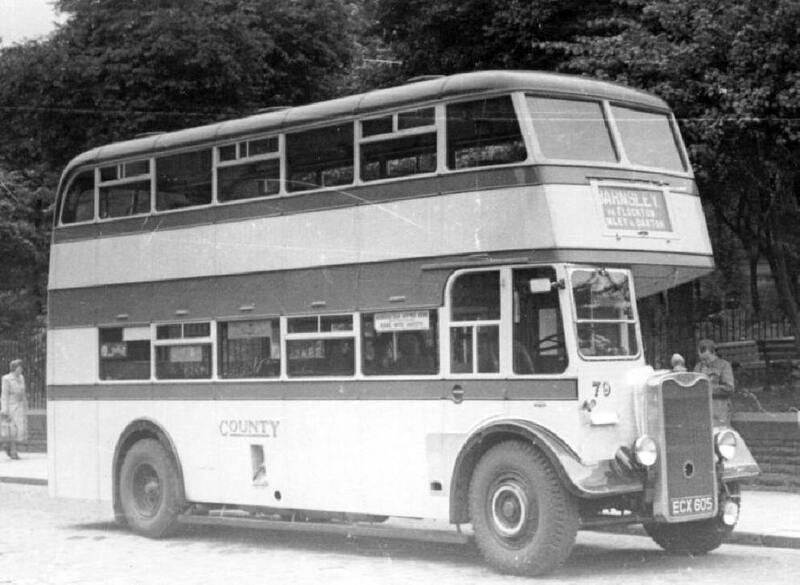 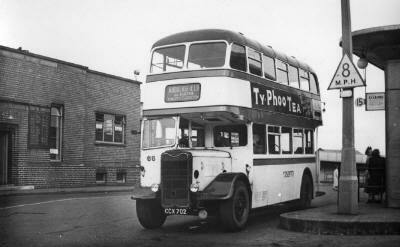 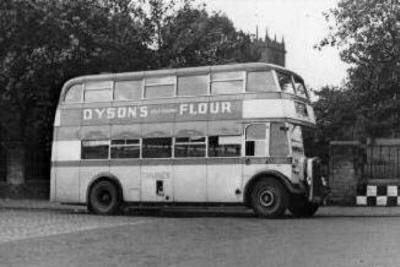 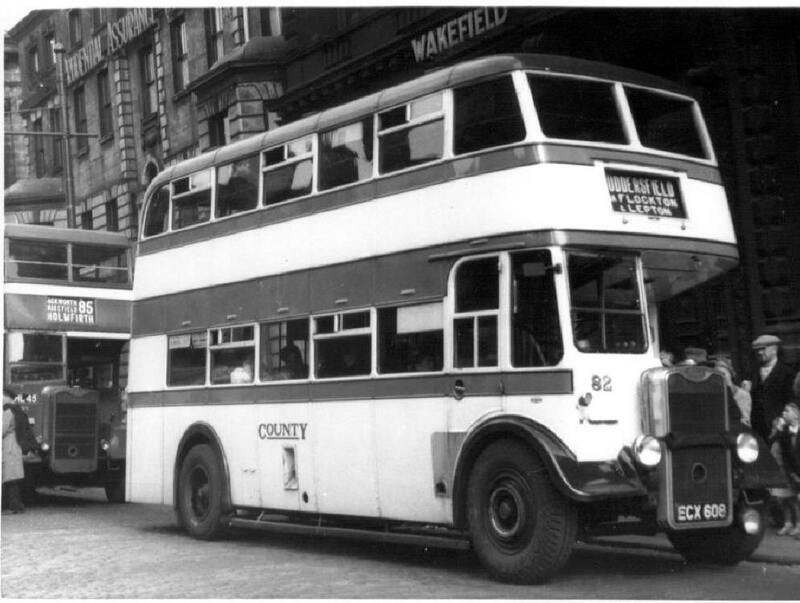 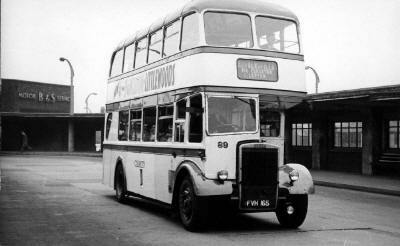 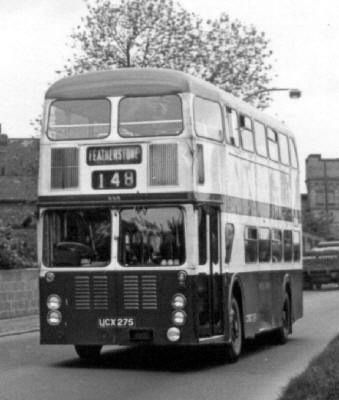 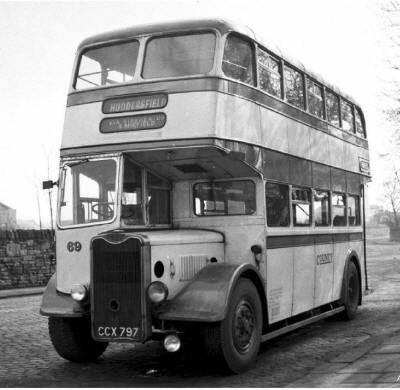 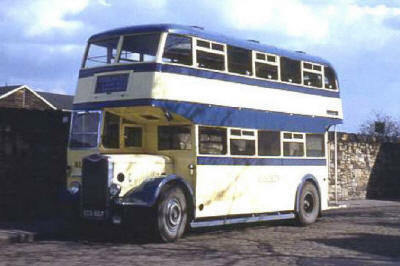 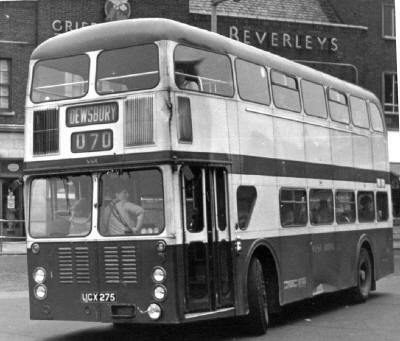 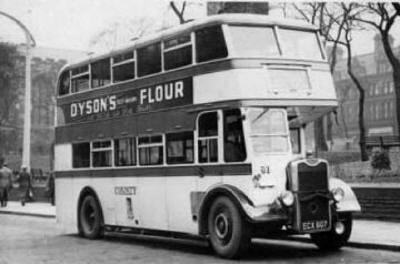 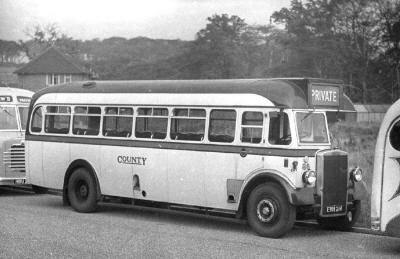 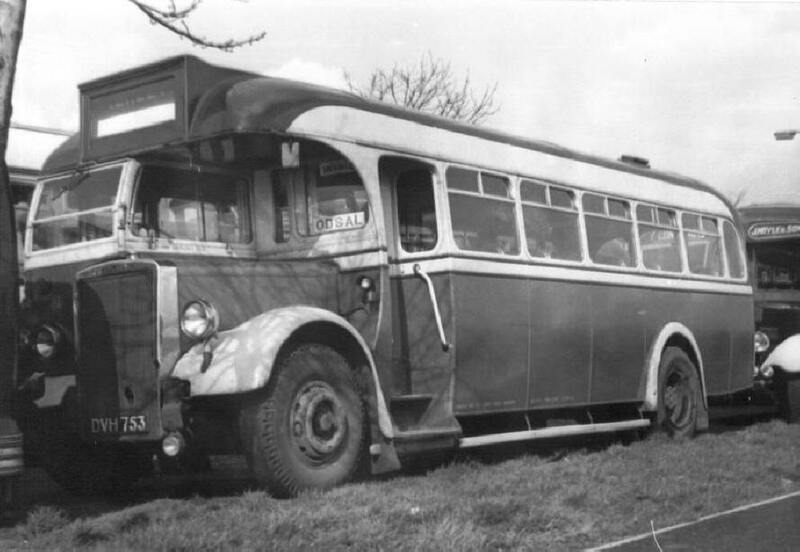 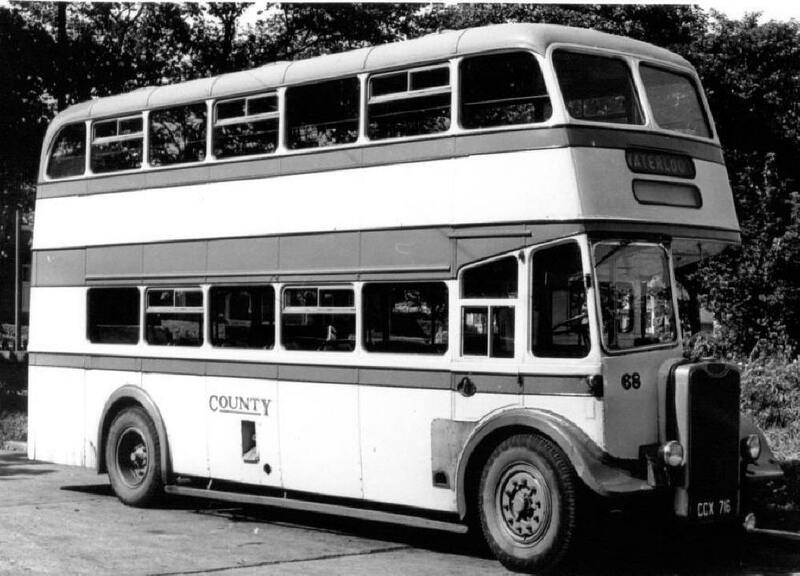 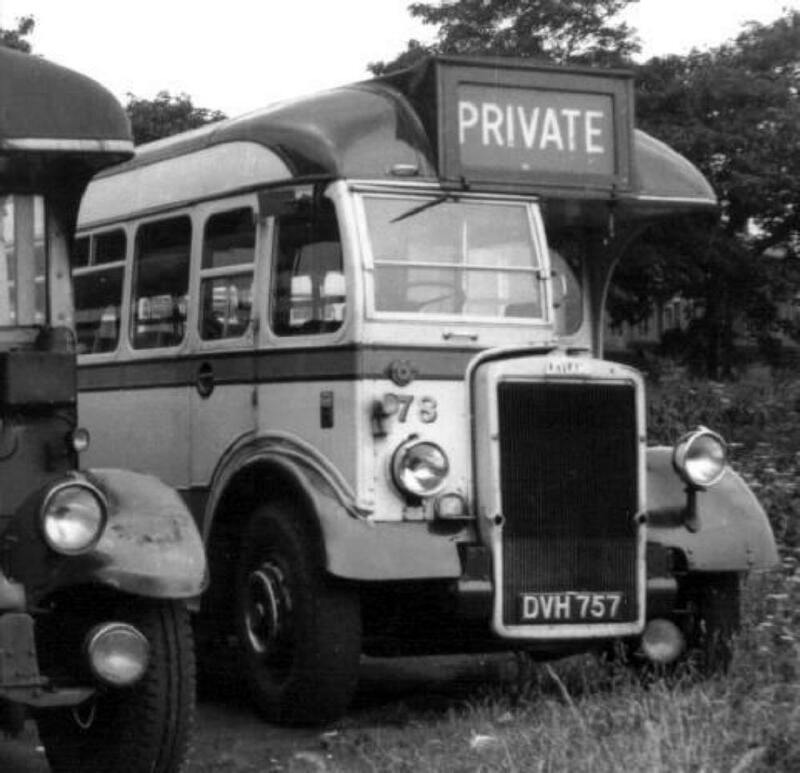 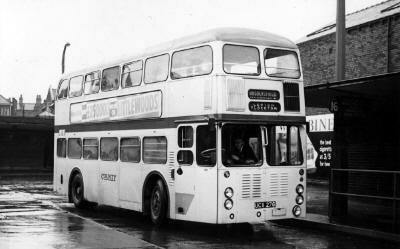 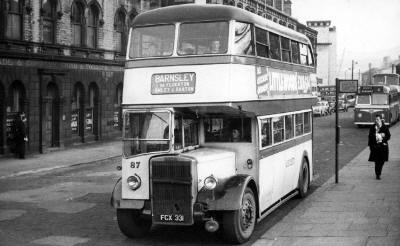 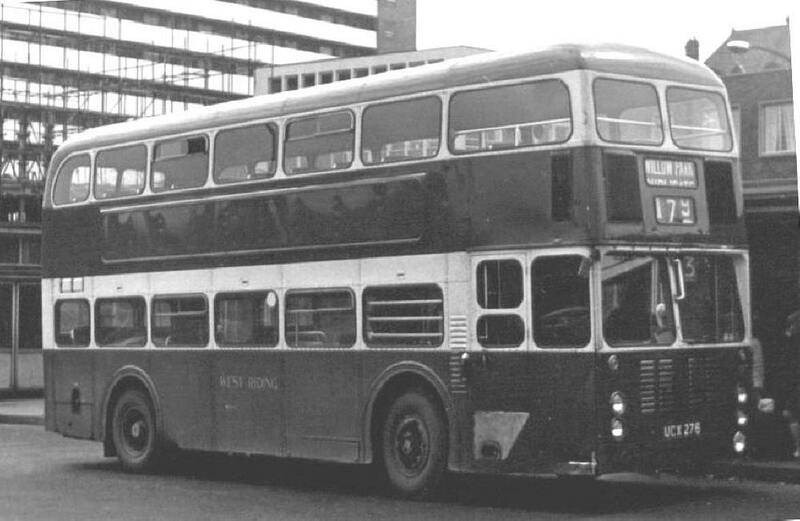 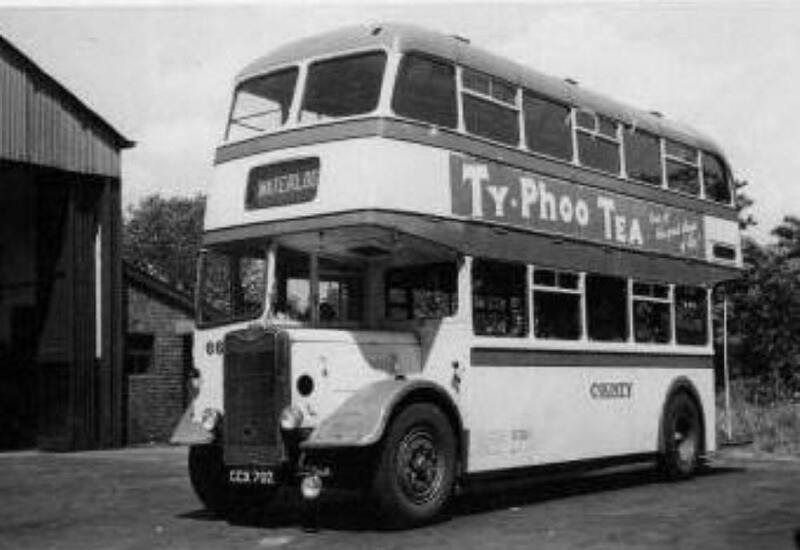 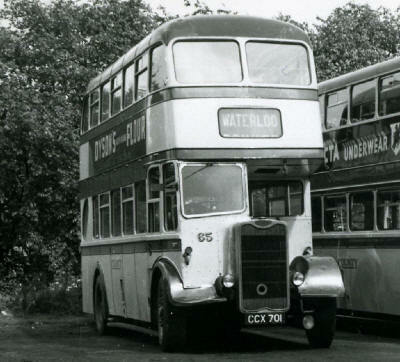 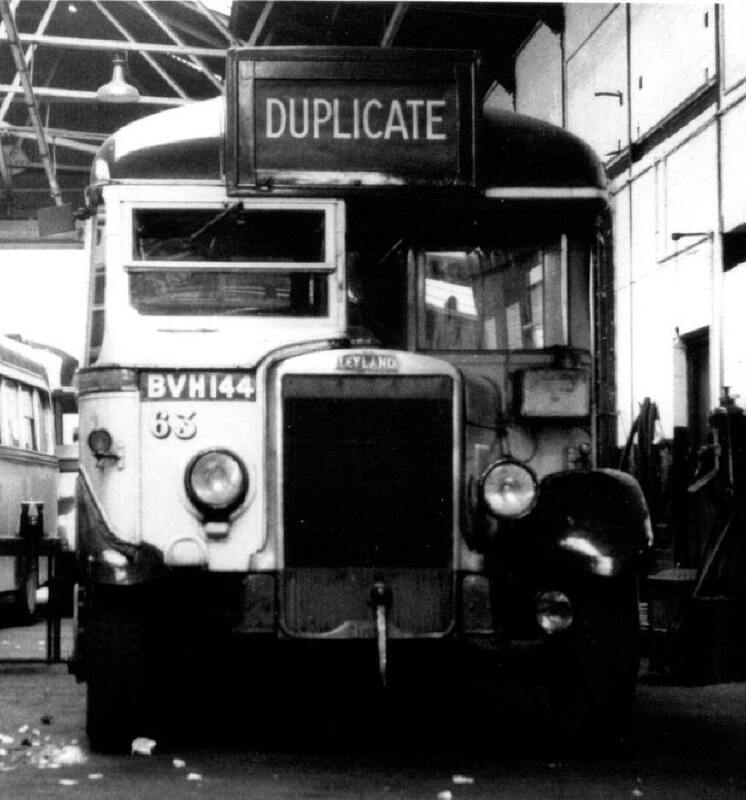 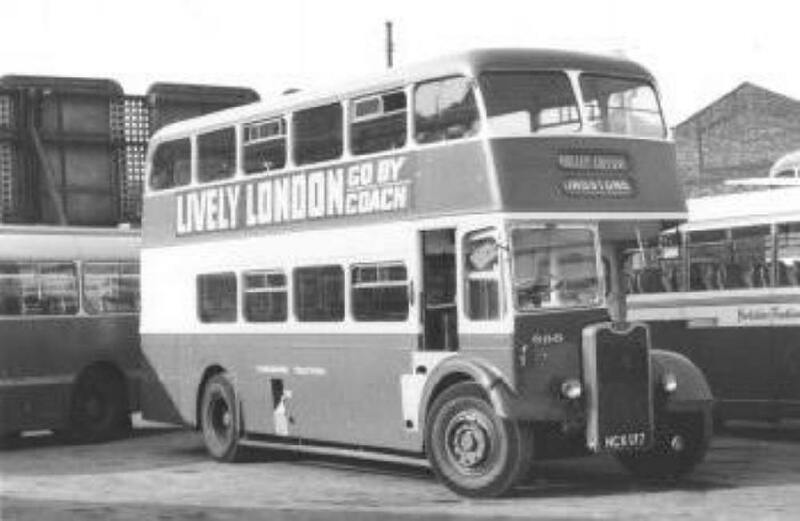 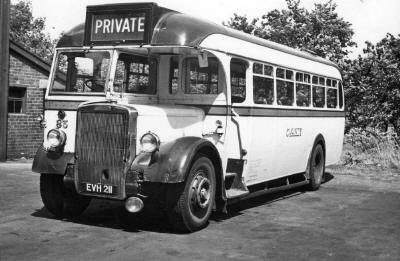 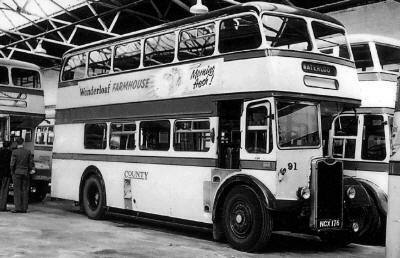 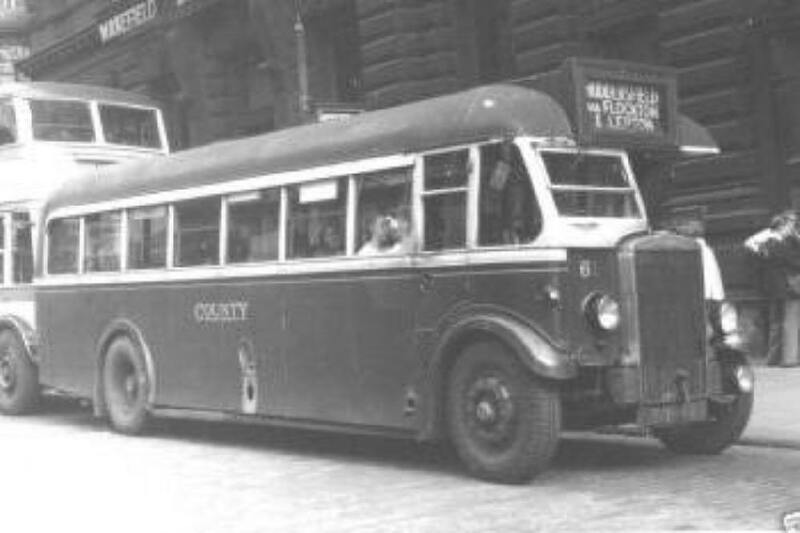 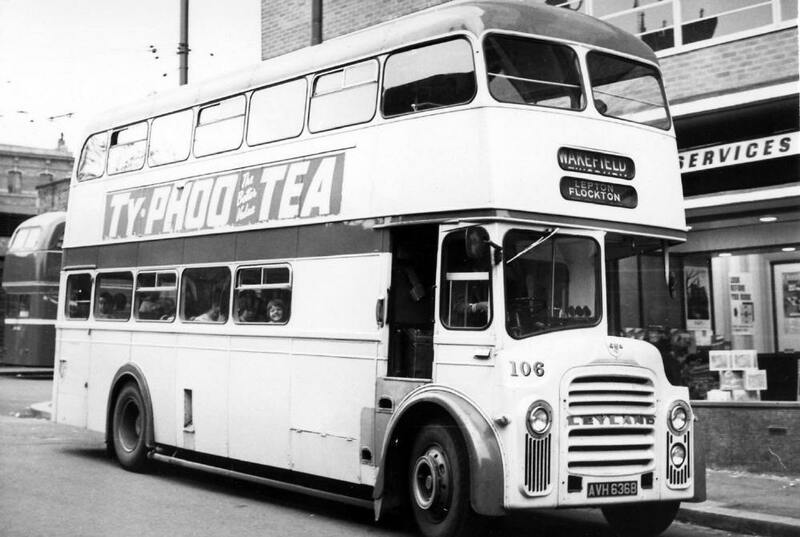 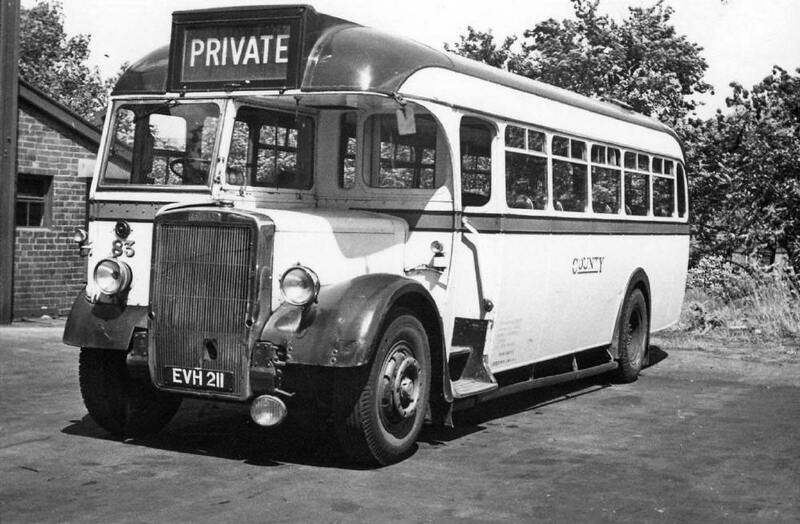 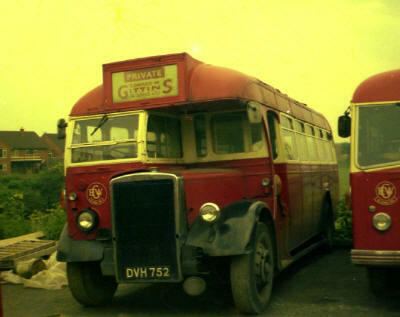 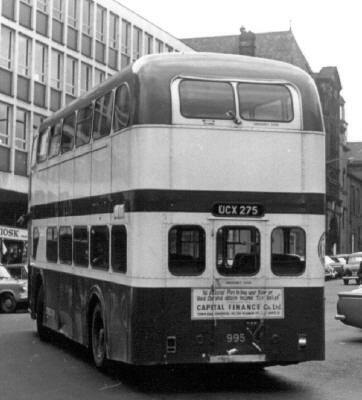 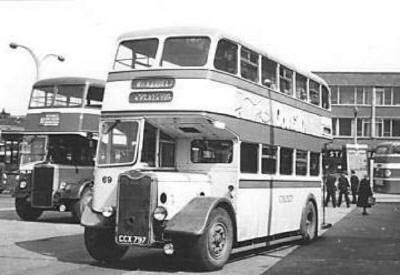 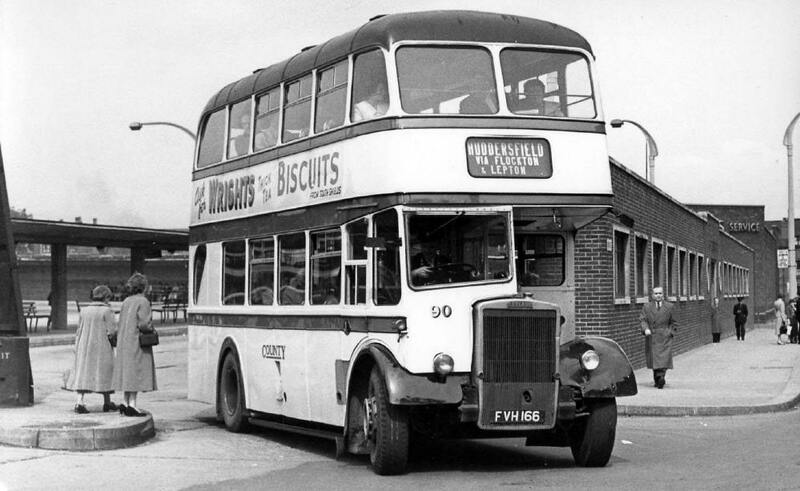 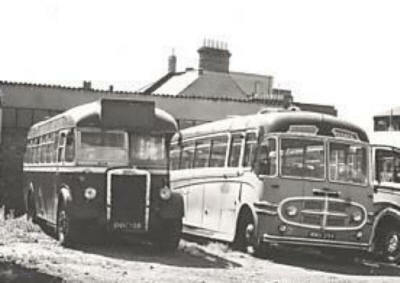 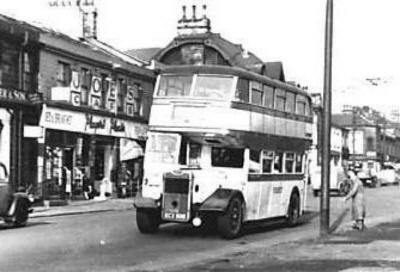 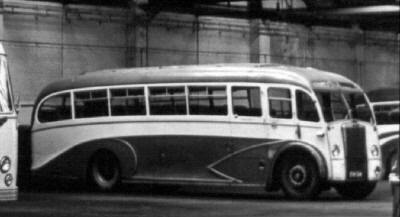 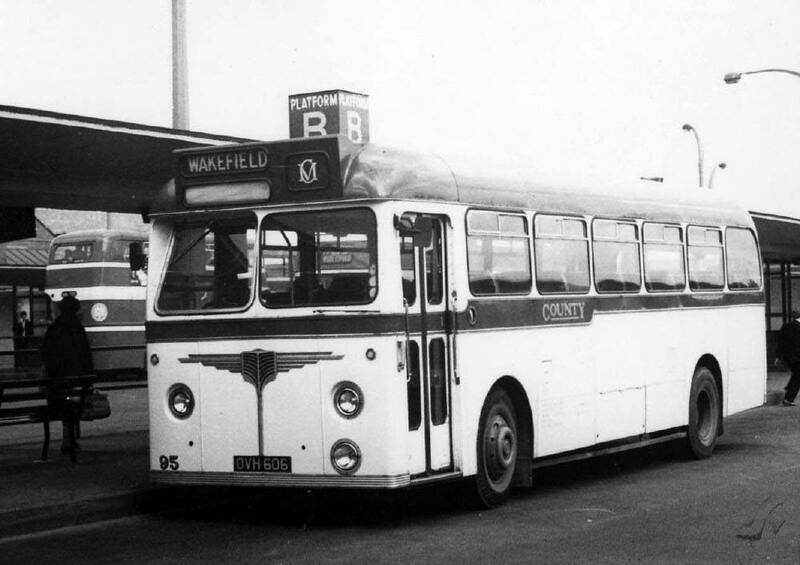 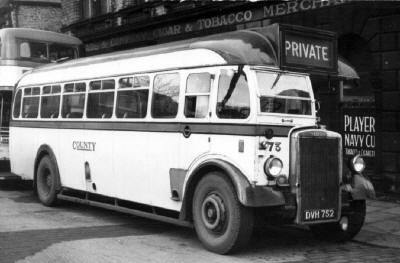 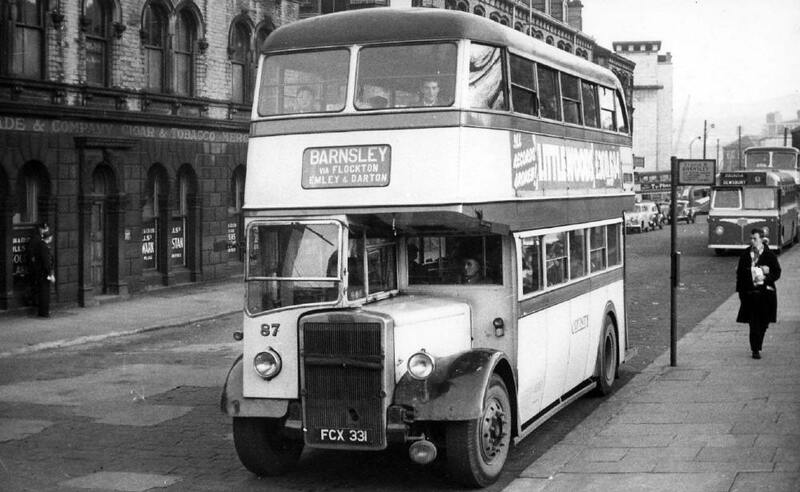 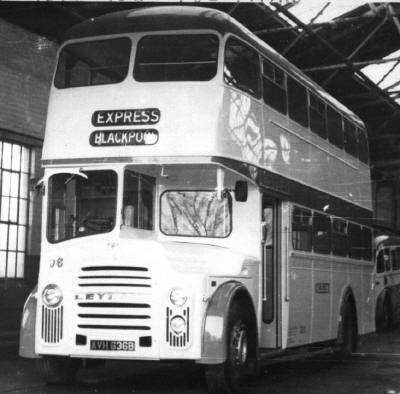 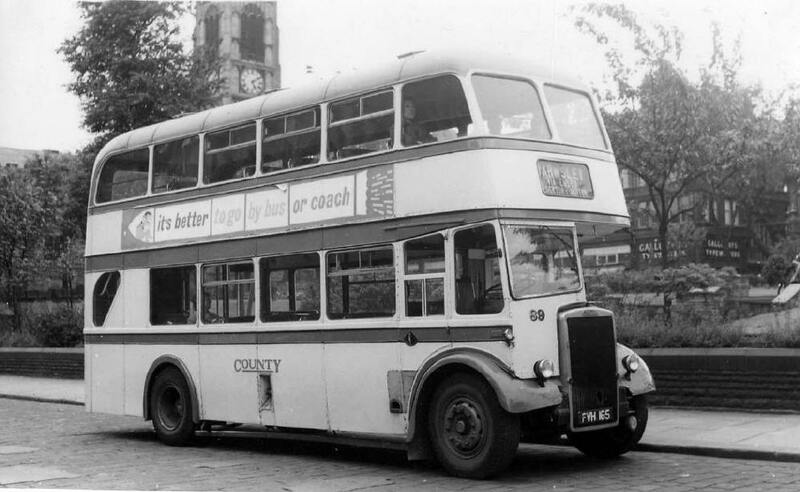 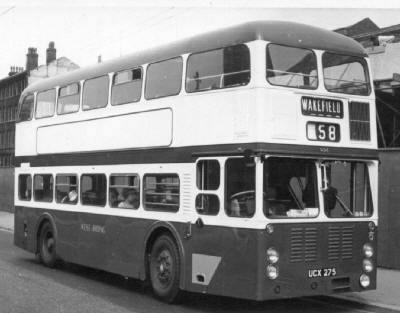 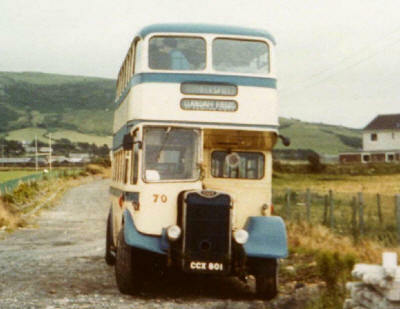 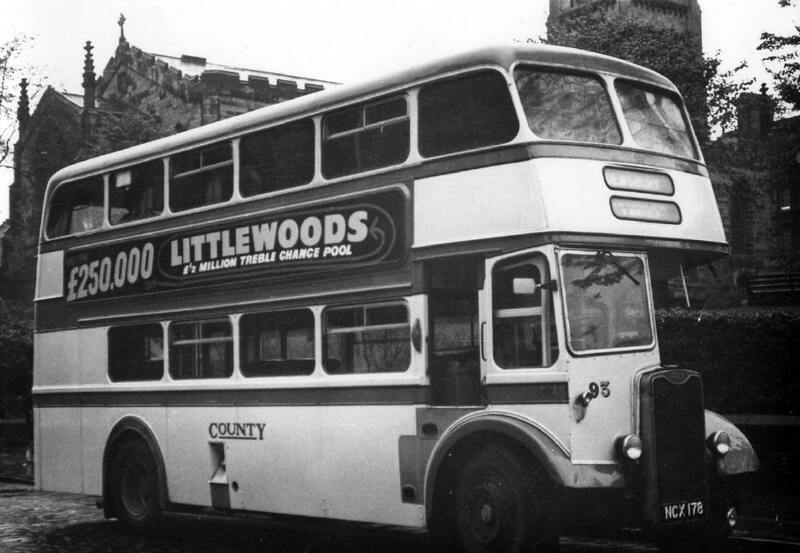 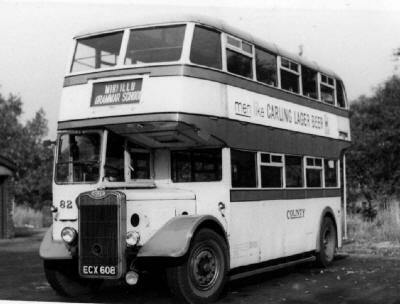 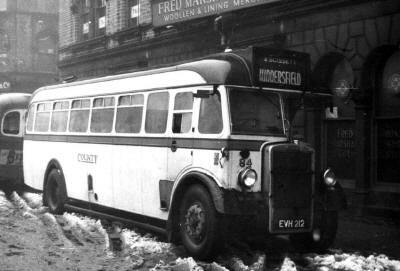 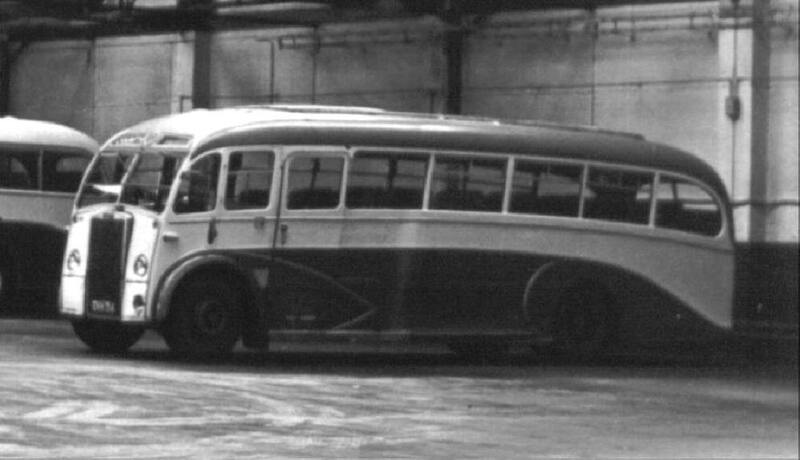 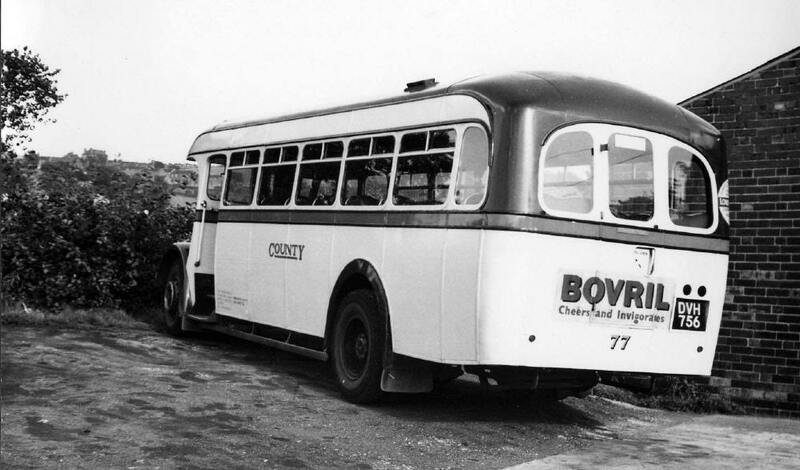 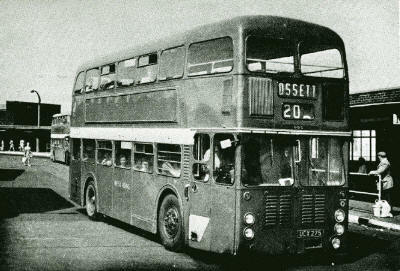 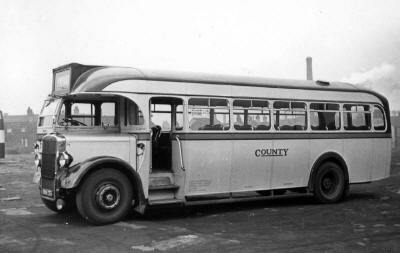 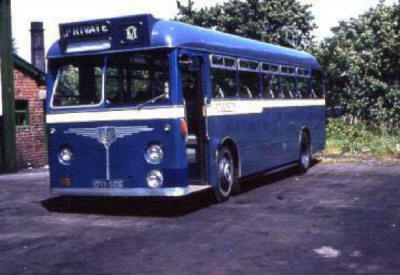 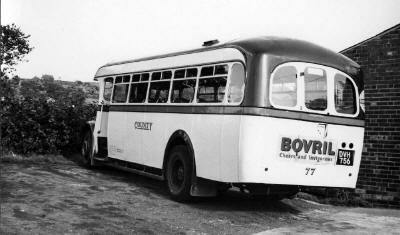 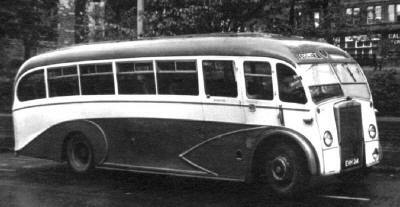 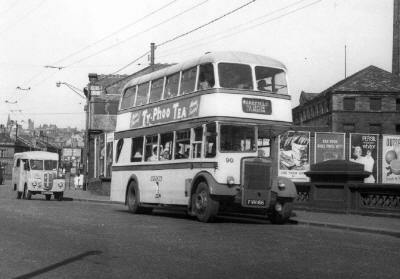 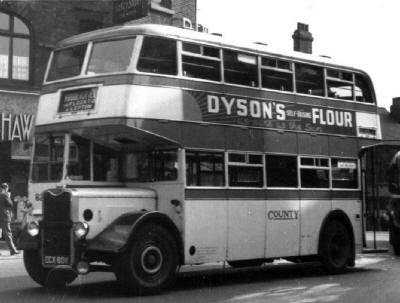 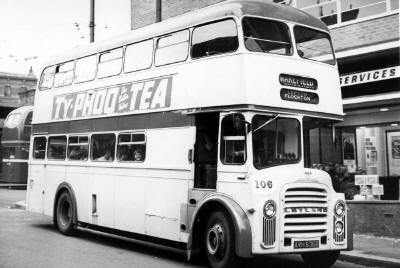 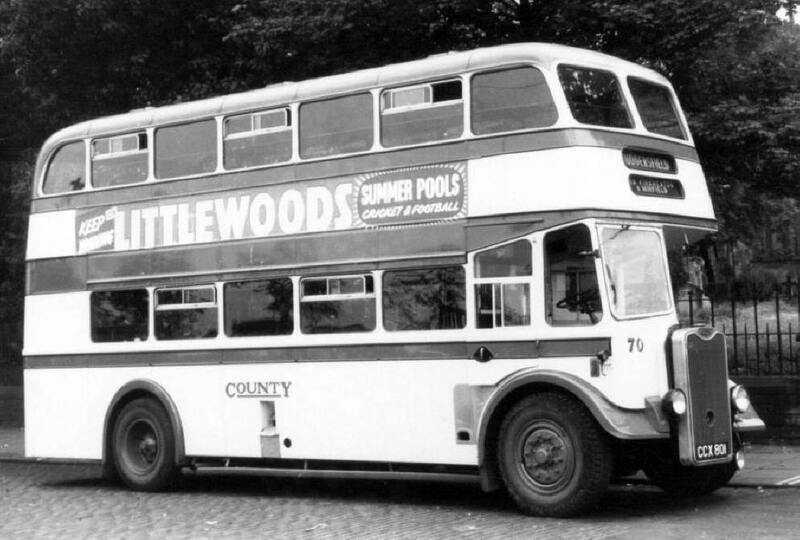 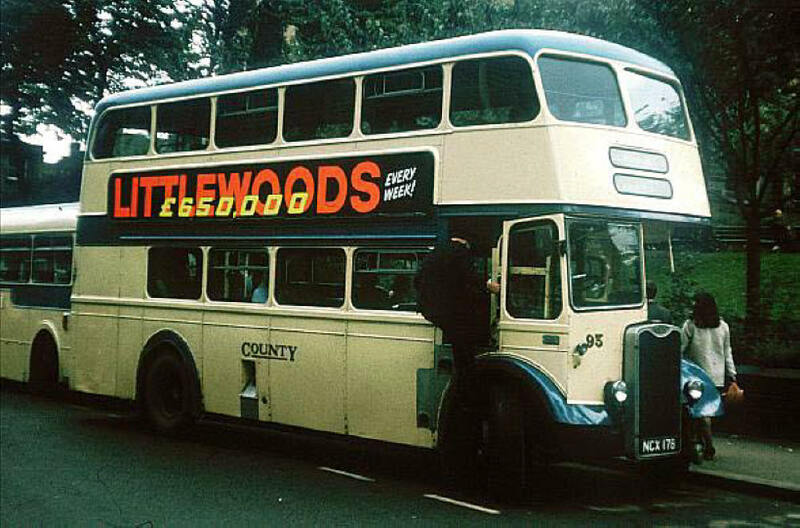 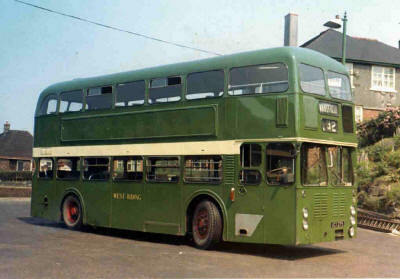 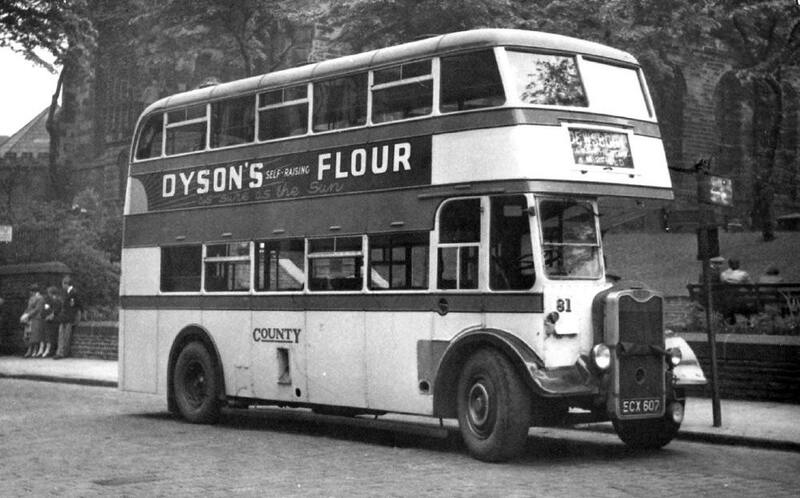 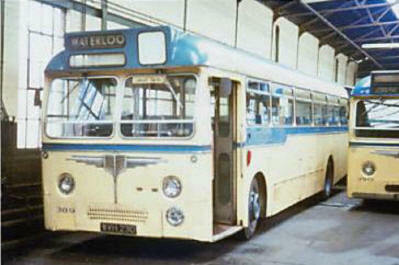 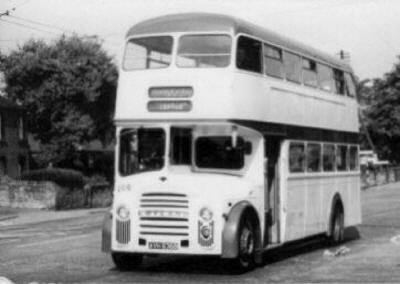 Double-deckers were used for the first time in 1943, when a pair of Leyland Titan TD2's were loaned by Yorkshire Woollen, although the company received its own double-deckers in 1944 (Nos. 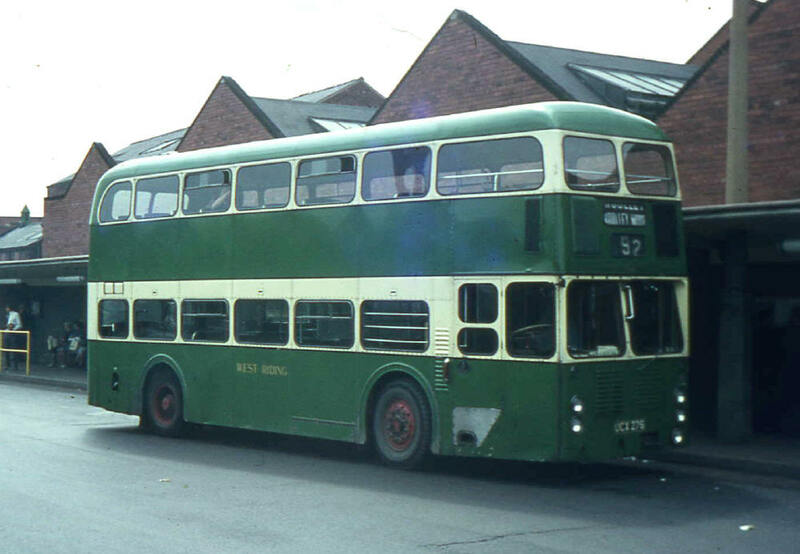 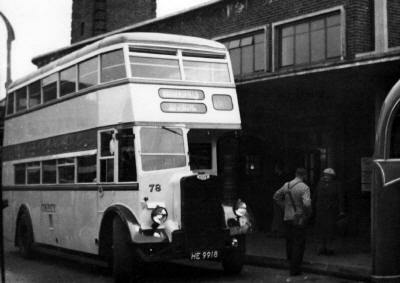 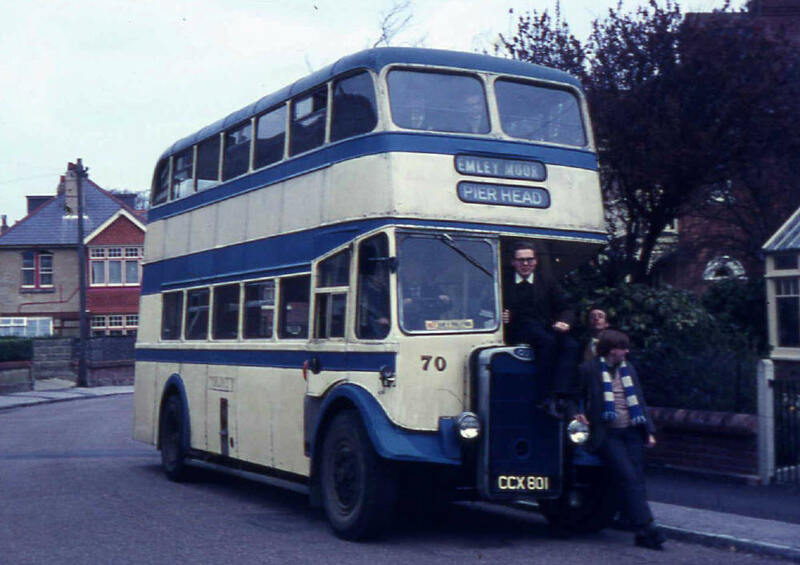 64-66) Guy Arab II's were delivered, GUY's remained the choice for lowbridge double deckers although two Highbridges were purchased the last four were also fitted with platform doors, Leyland provided all single deckers from 1928 and six Highbridge Leyland Titans. County GUY 70 is preserved. 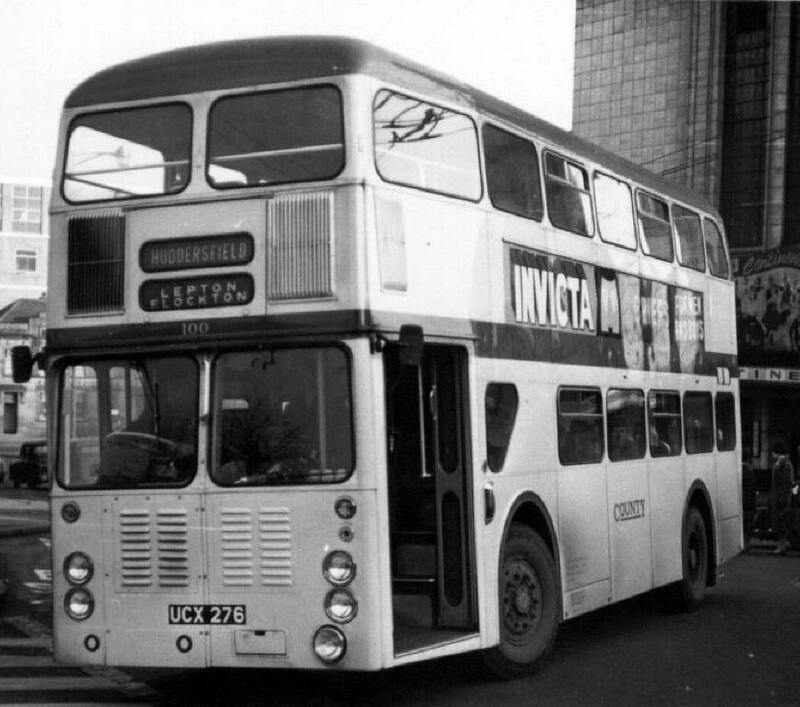 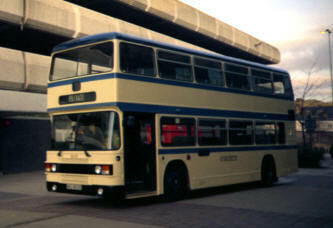 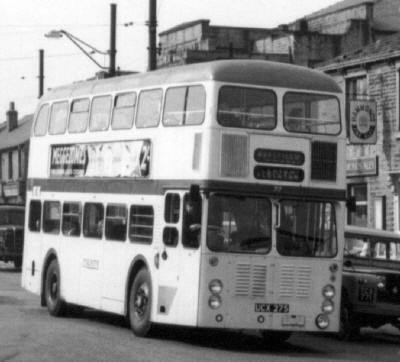 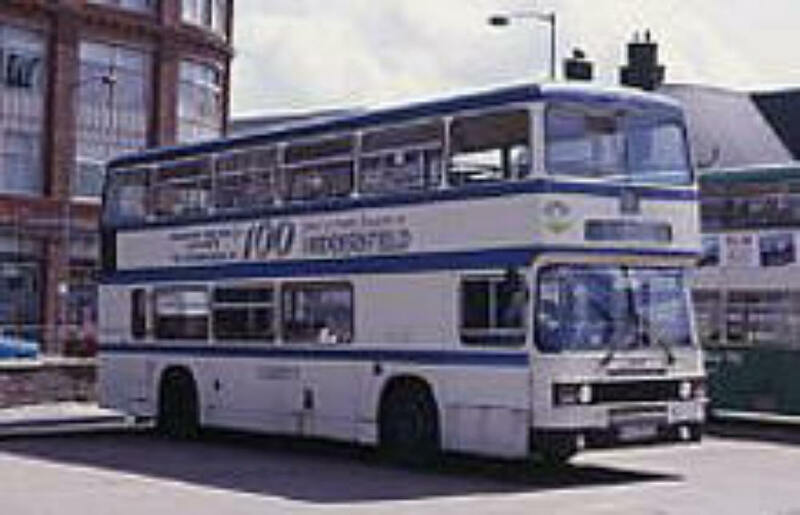 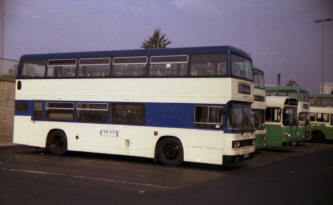 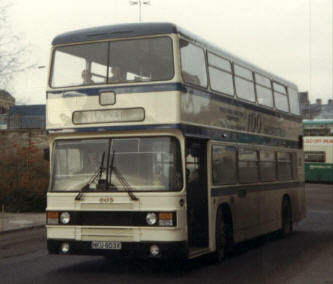 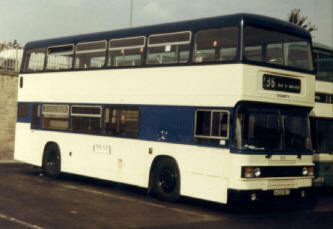 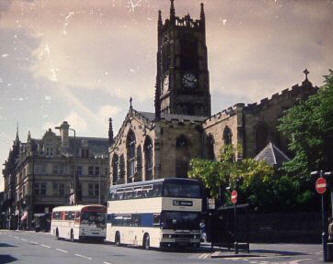 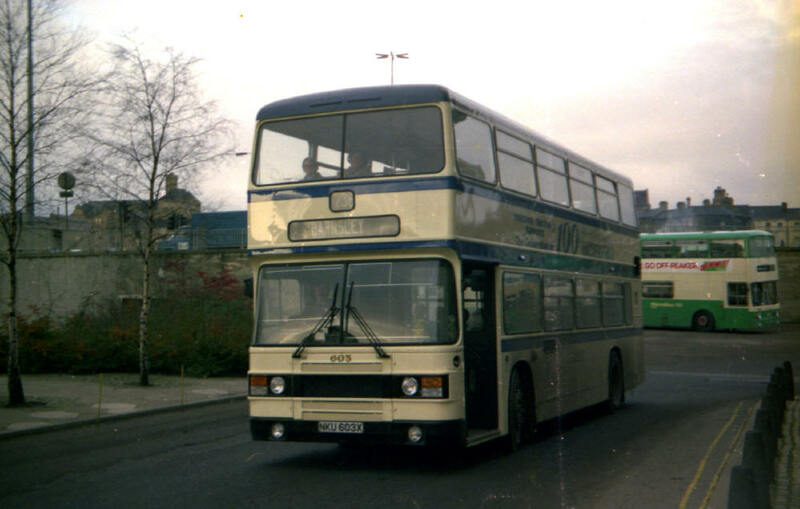 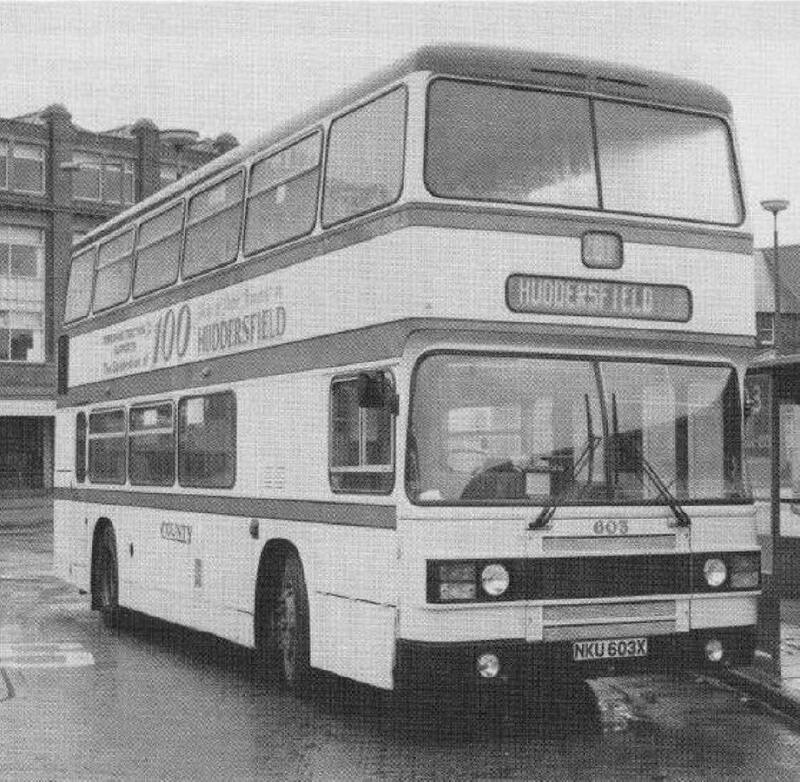 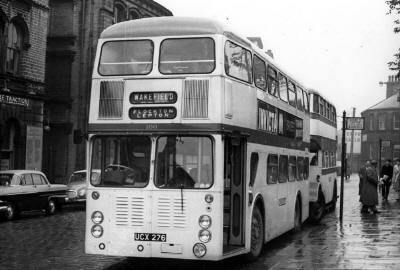 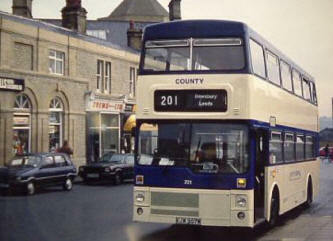 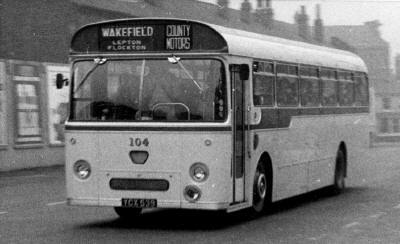 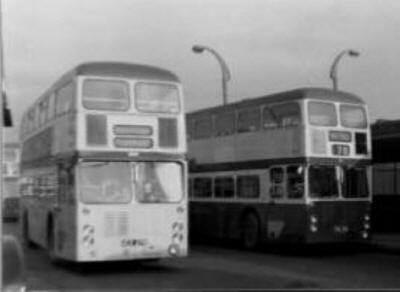 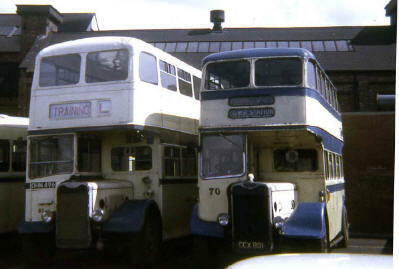 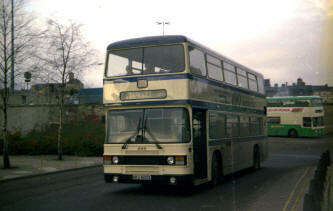 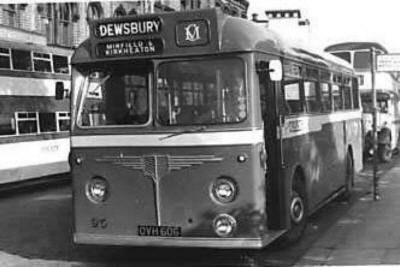 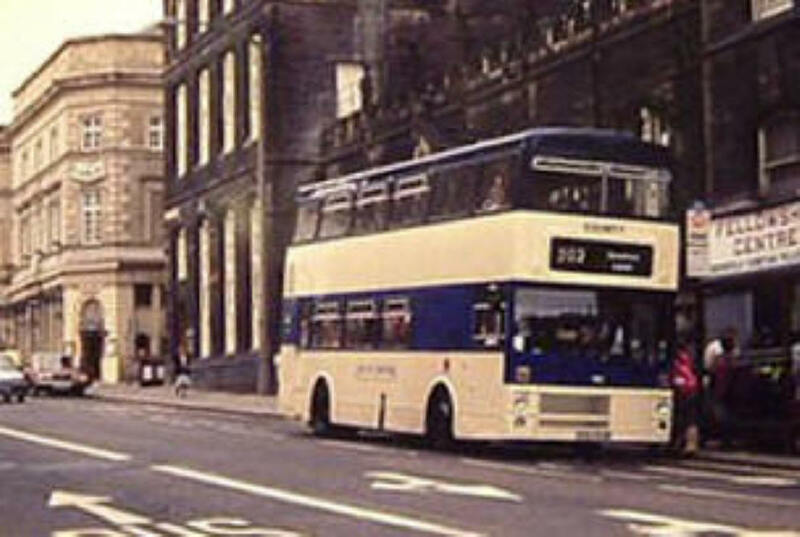 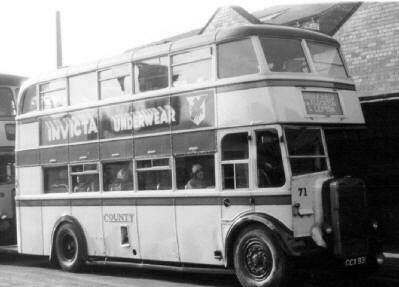 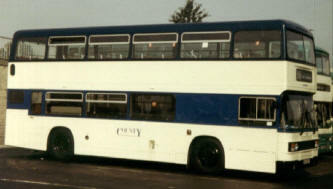 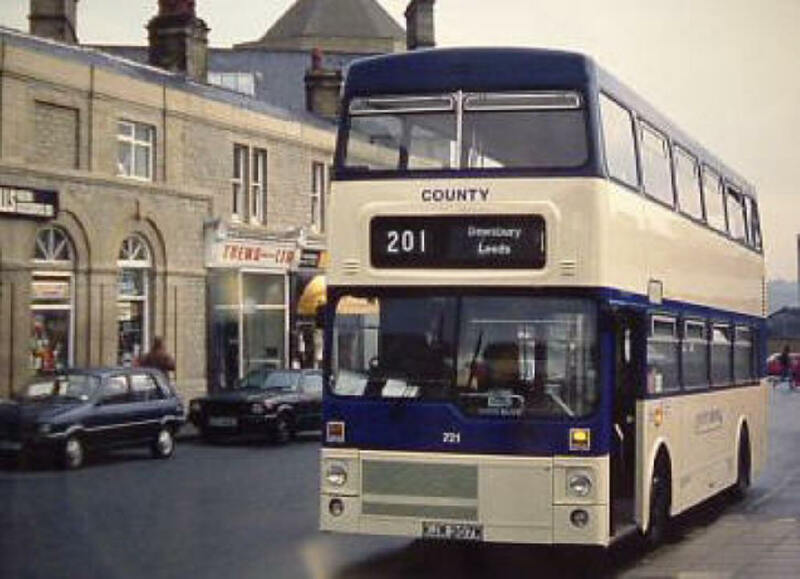 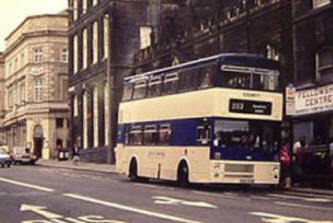 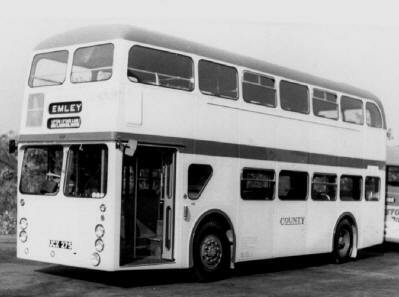 County never used service numbers for their own services but all Leyland Titan PD2s 87 and 88 did have destinations for the joint service of Yorkshire Woollen and Huddersfield Joint Omnibus Committee services 26 and 27 Huddersfield to Dewsbury service, they operated on this service regularly both with County Motors and Yorkshire Woollen crews in their later years. 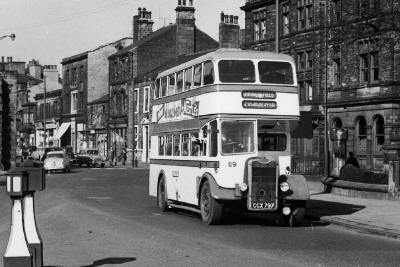 The influence of West Riding was seen in the purchase of two (Nos. 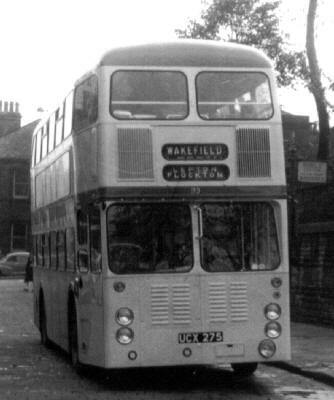 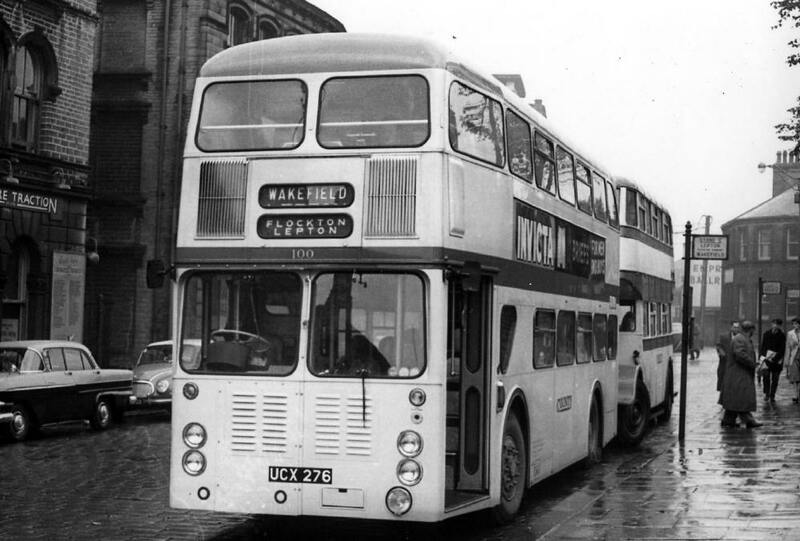 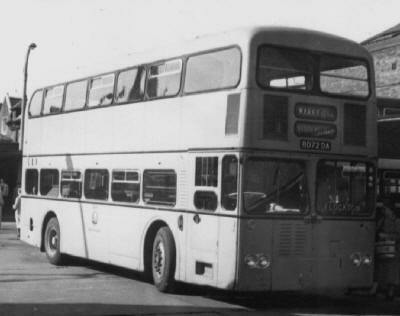 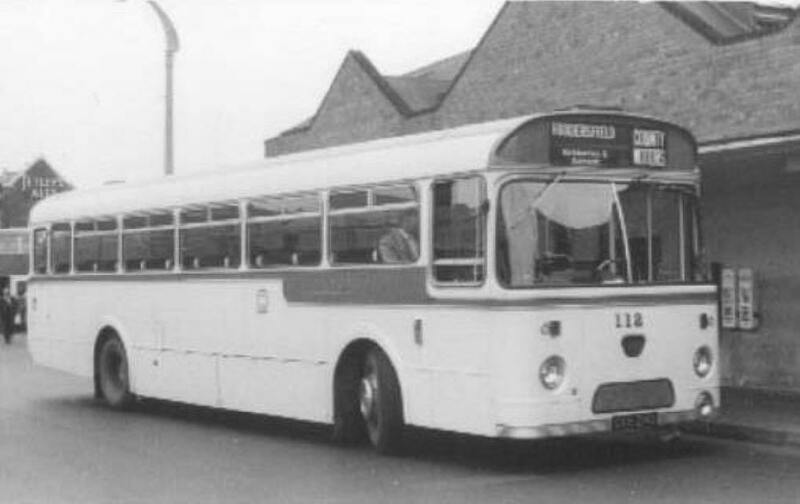 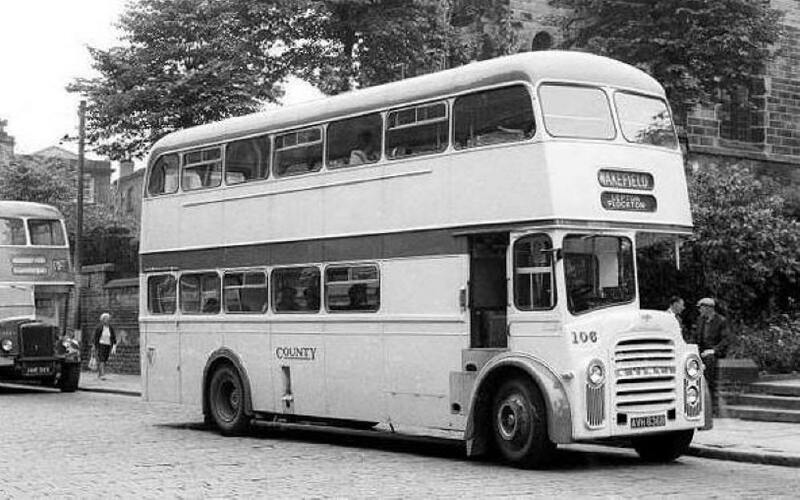 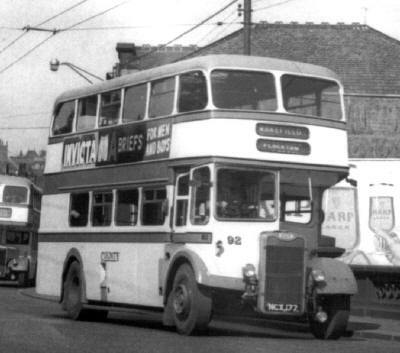 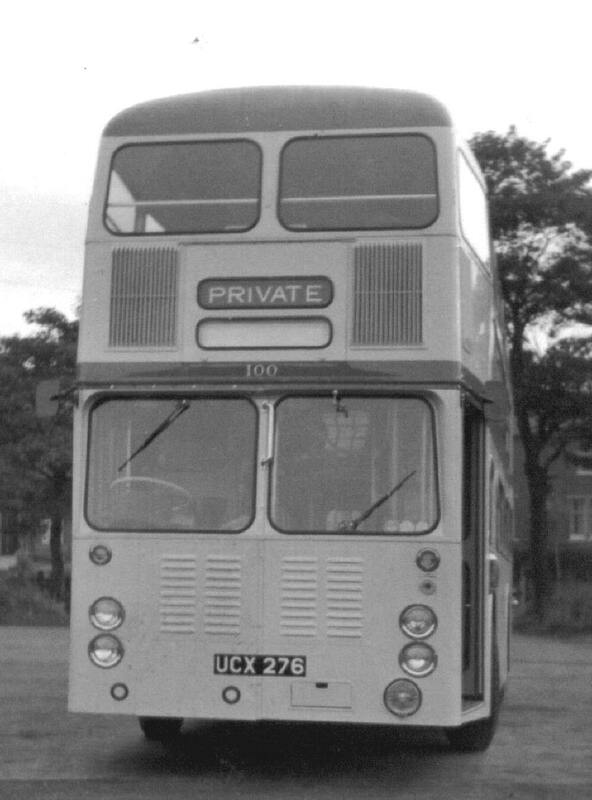 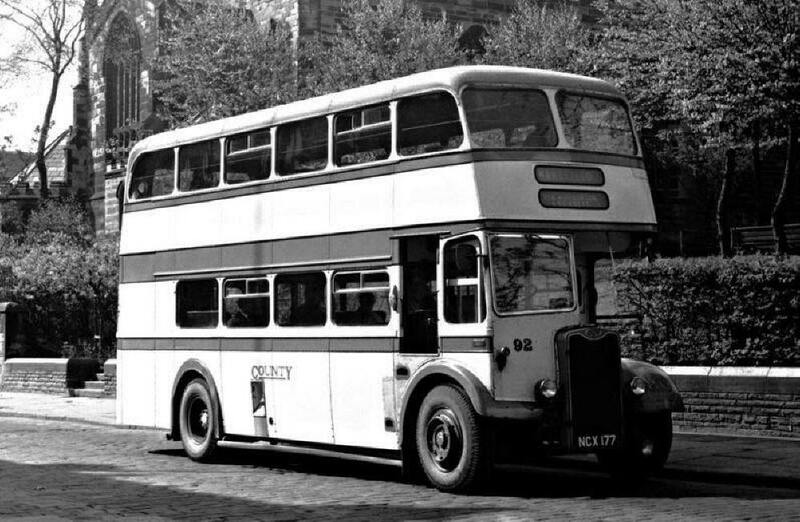 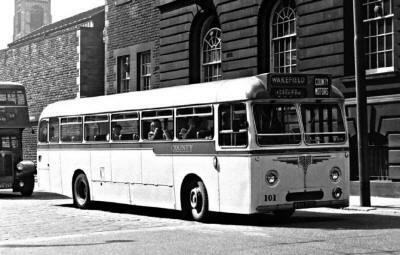 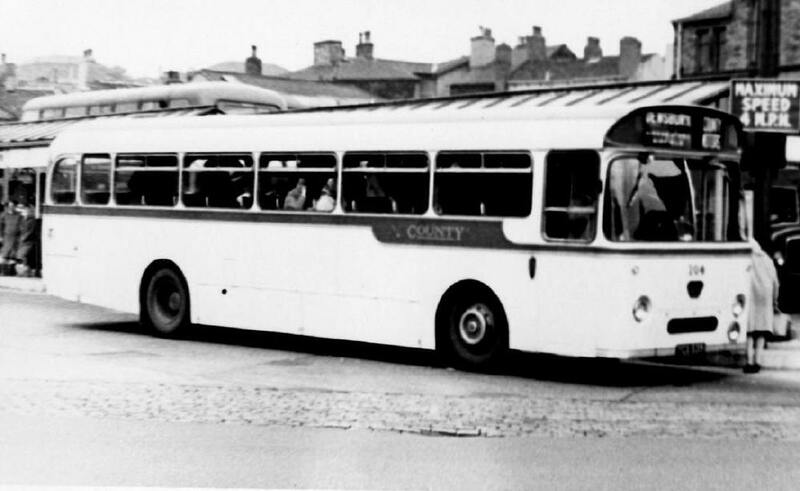 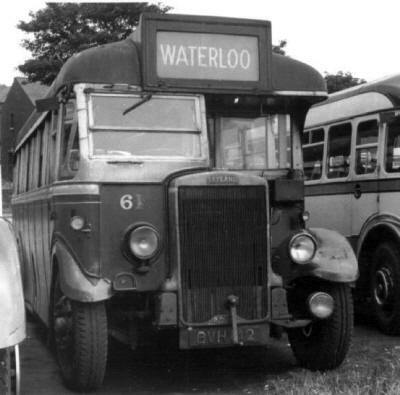 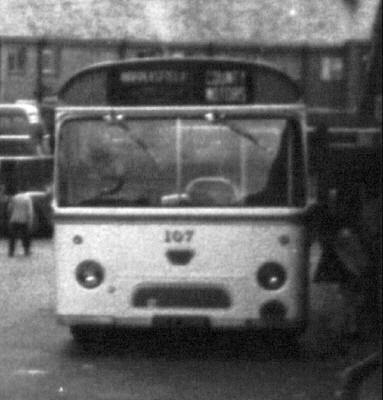 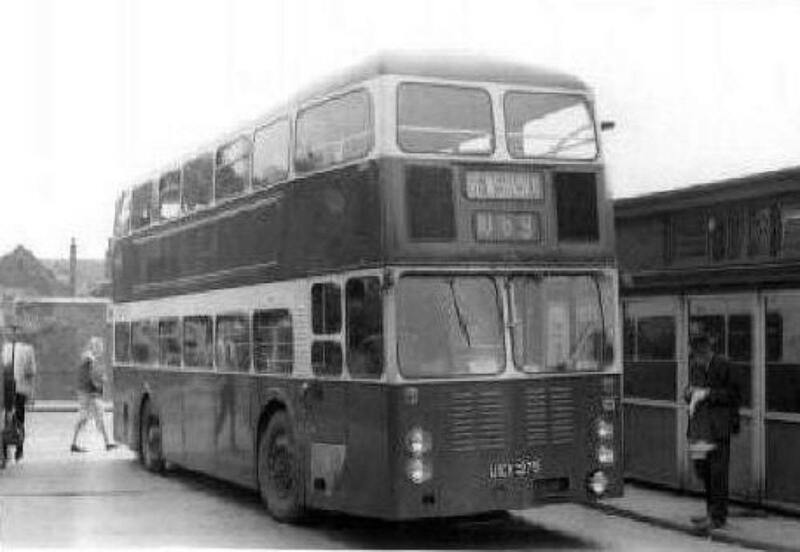 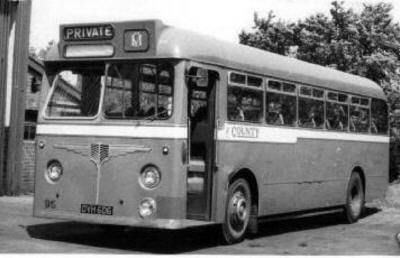 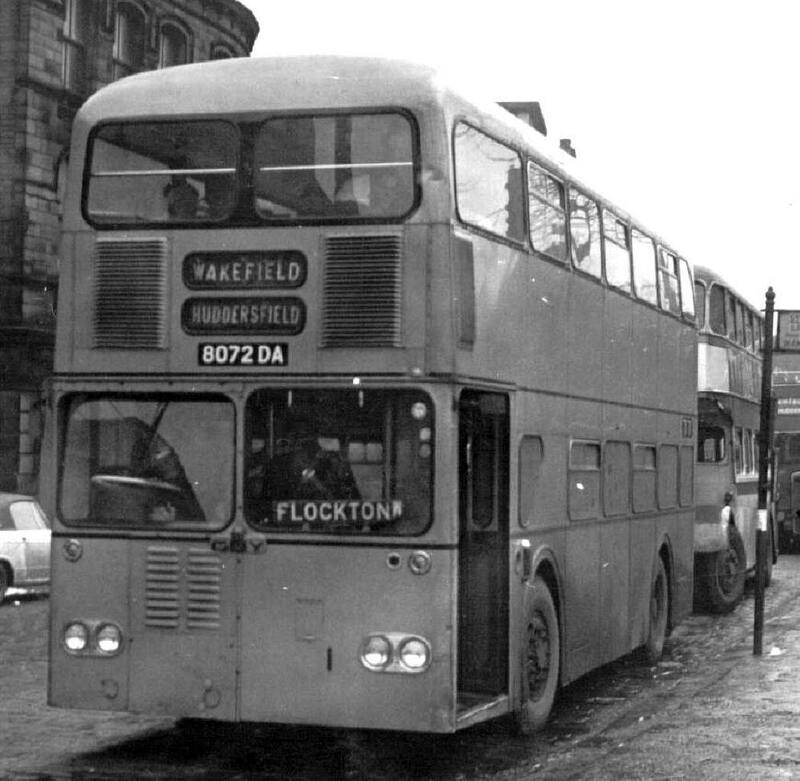 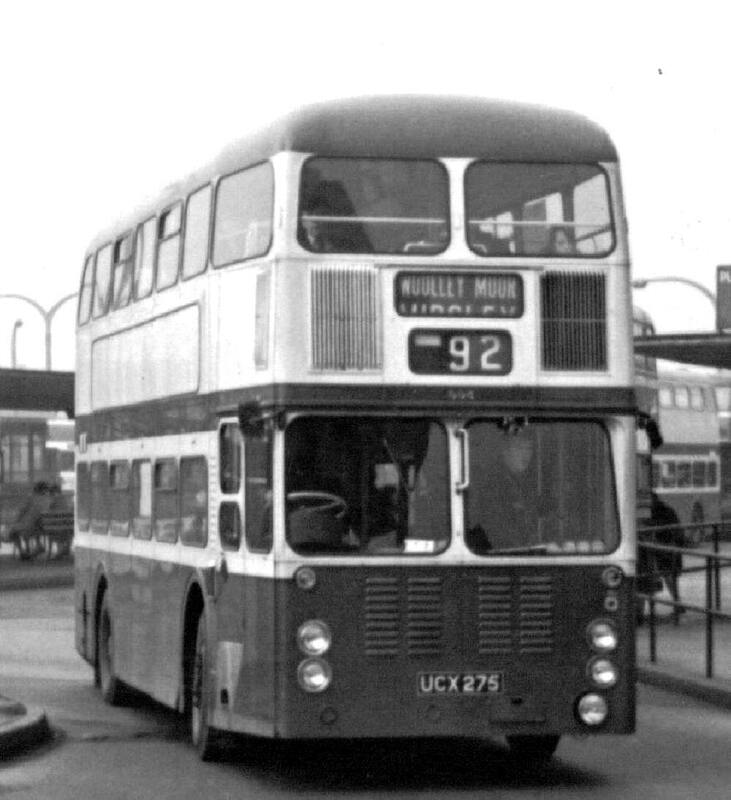 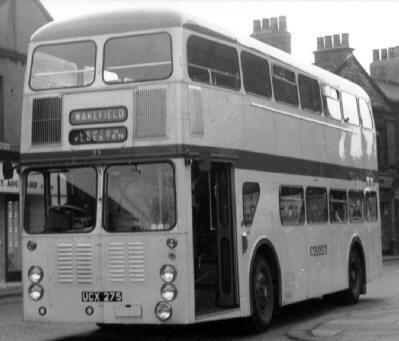 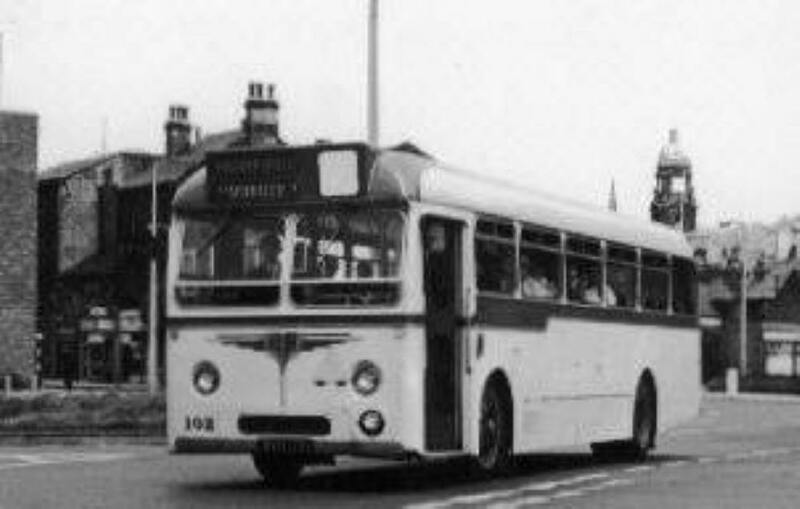 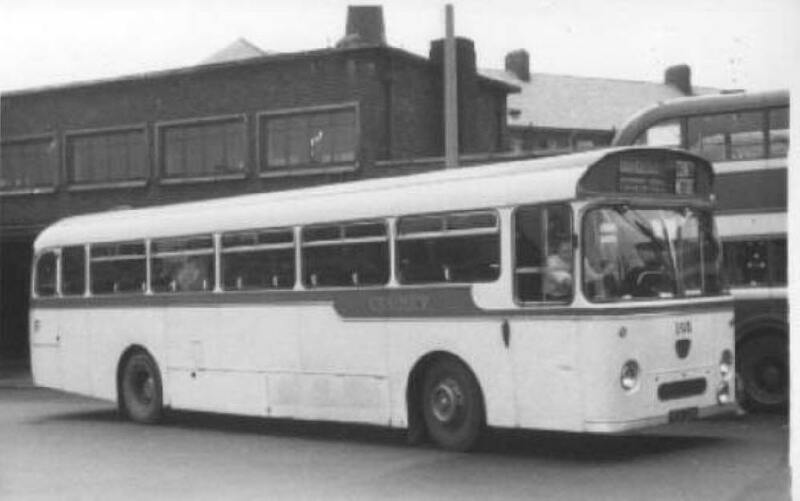 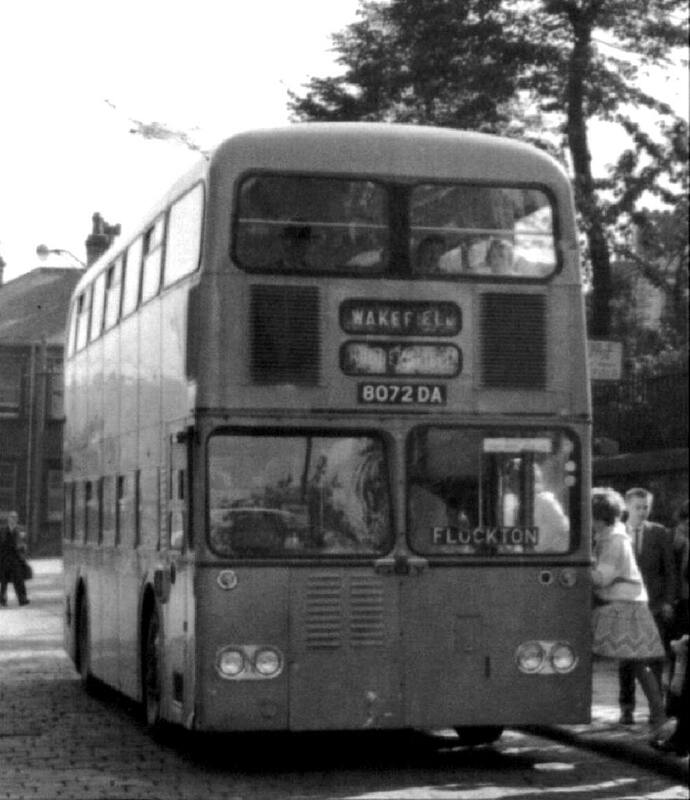 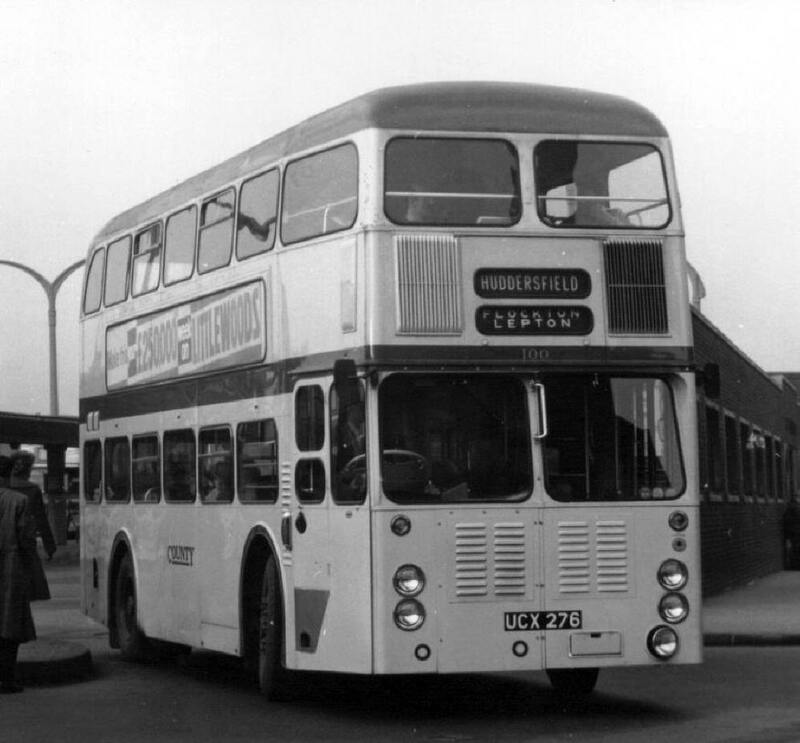 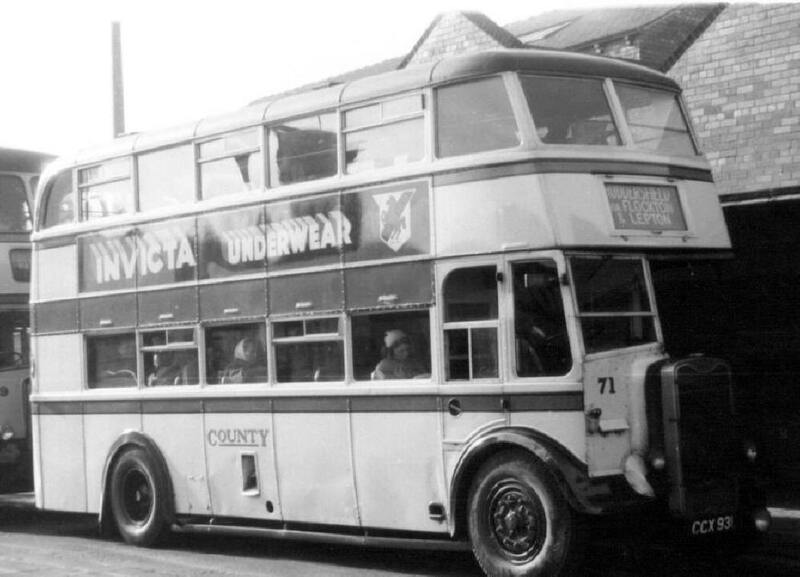 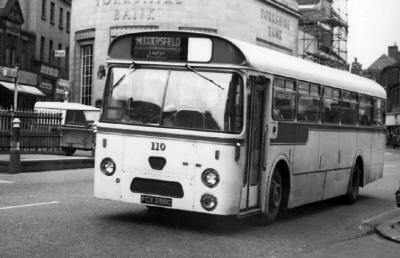 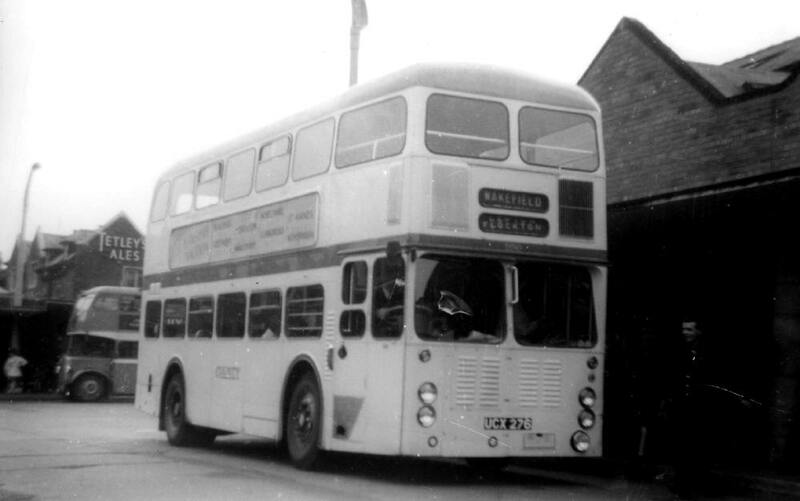 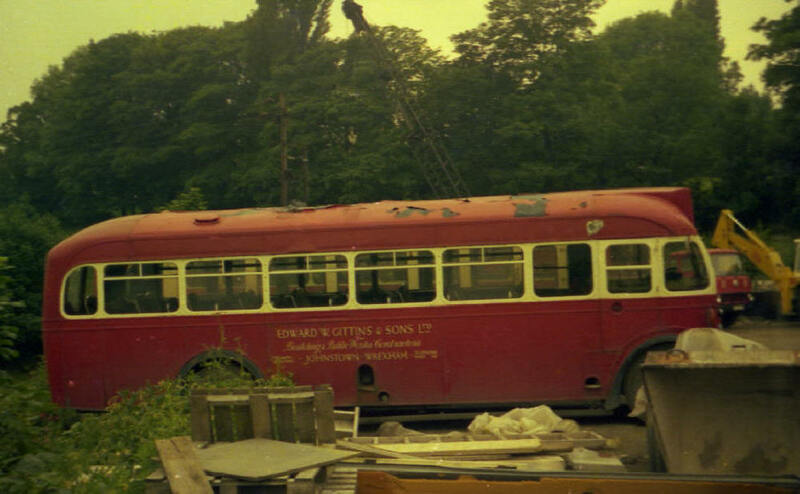 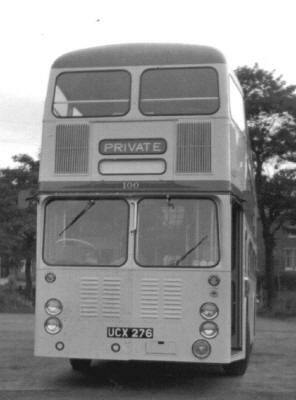 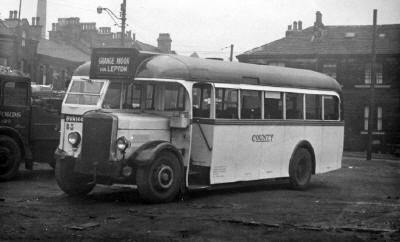 99-100) Guy Wulfrunians in 1961, but they remained in service for just two years before passing to the West Riding Fleet 99 is now preserved, each one was regularly replaced by Wulfrunian 8072DA of GUY motors as modifications were required. 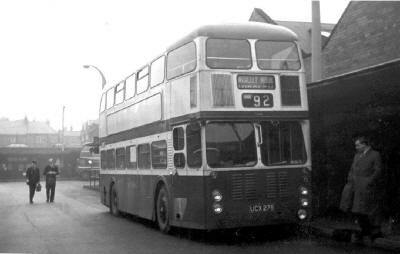 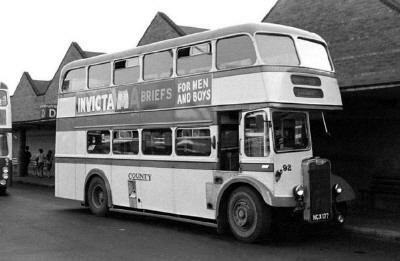 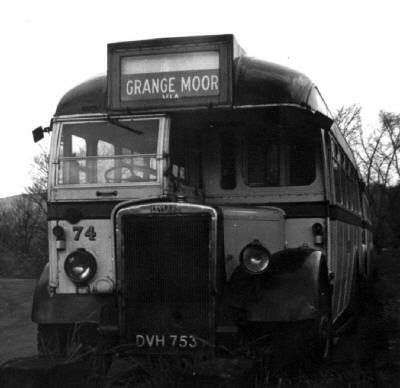 8072DA and its sister vehicle also ended up at West Riding but only to supply parts. On the 30th October 1967, the West Riding Automobile Company was acquired by the Transport Holding Company, and on 1st March 1968 the BET shareholding in the other two joint owners passed to the THC. 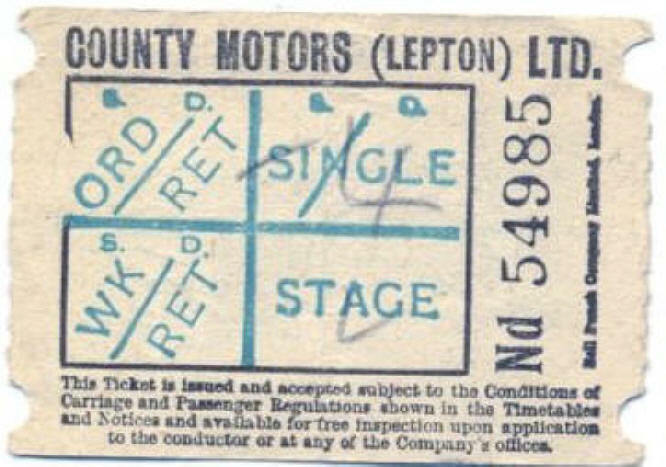 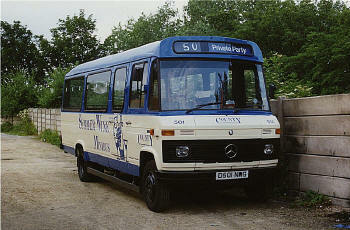 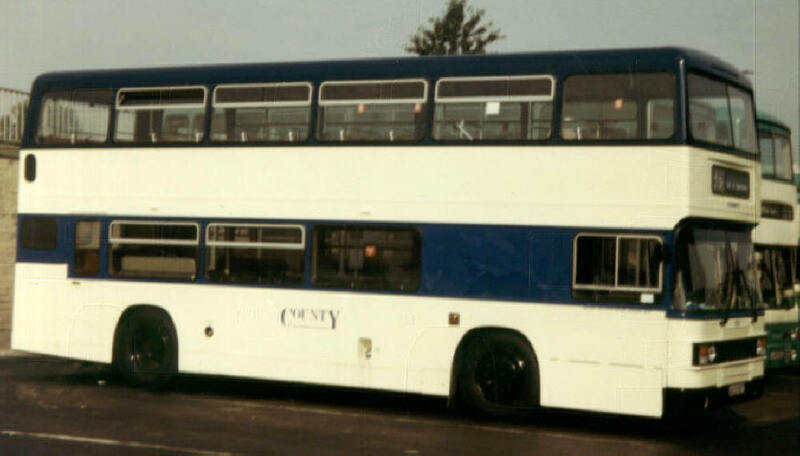 As a result all three co-owners were now nationalised and part of the same company removing the need to keep County Motors as a separate operating unit. 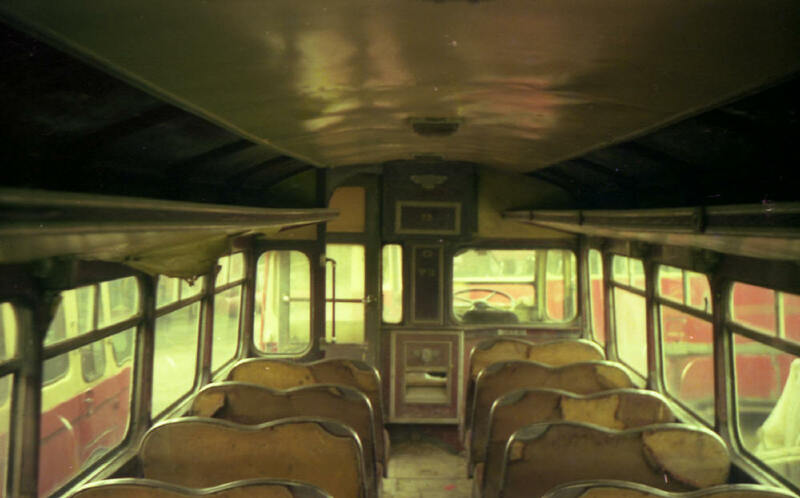 Consequently, on the 1st October 1968, control of the company was passed to the Yorkshire Traction Company Ltd, bringing to an end the separate existence of this tiny fleet.